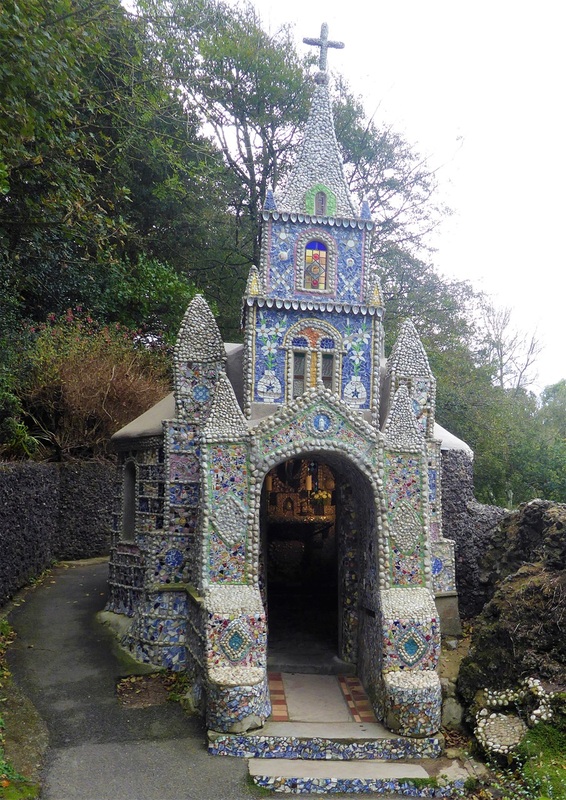 30th October - Jack Frost is sharpening his long, bony fingers now!! Days are still warm for the end of October, but the clear skies mean low temperatures at night, with the first frost of the season whitening the rooves and grass this morning. 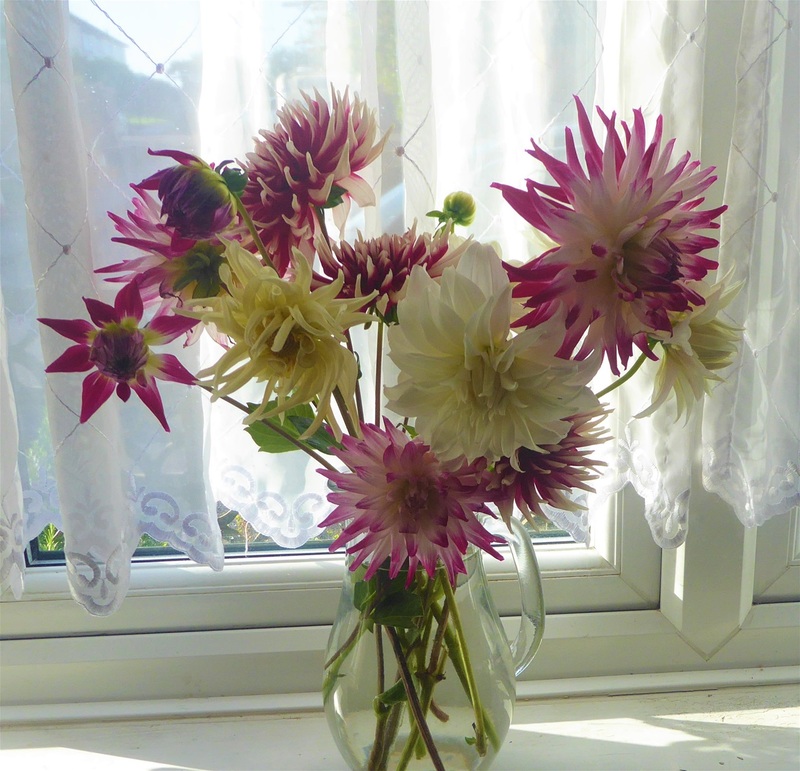 Not sure for how much longer we shall be cutting dahlias, so am sharing a picure of the ones picked yesterday, with some of the cosmos stiill flowering their socks off. The bubble plastic insulation is up in the greenhouse and the more tender plants such as half hardy succulents are under cover already. 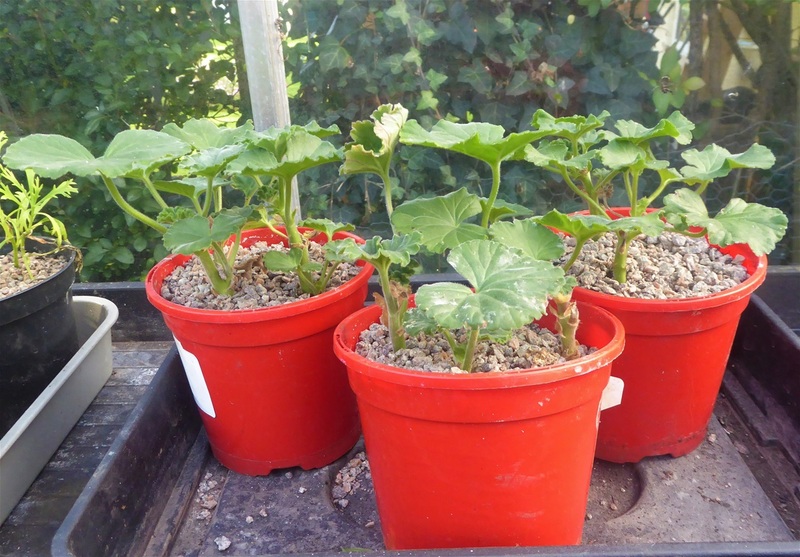 The greenhouse will gradually fill up as the pelargoniums are cut back and potted up, and spider plants and so on moved inside for the Winter. At the plot the Yacon leaves caught the frost last night, so these huge pots are now in the safety of the polytunnel, which might give them another week or two of growth. 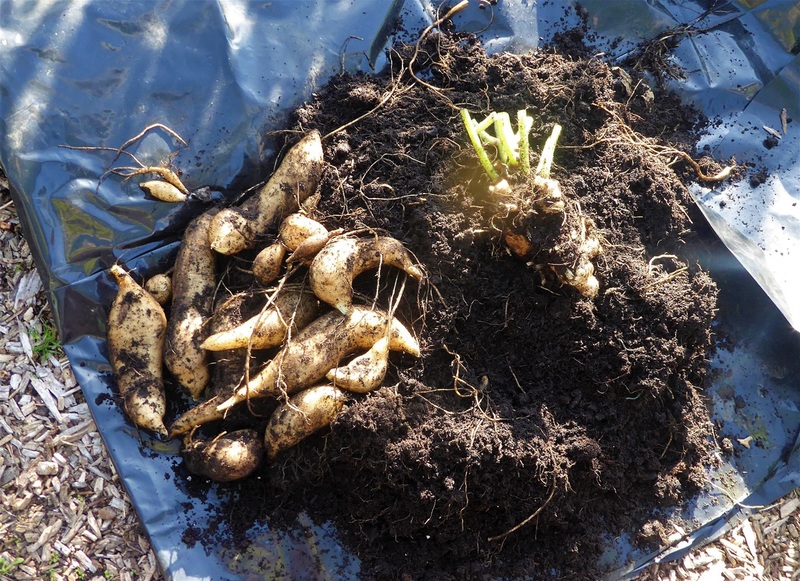 That seems a good place to begin Harvest Monday, with a real first for us, Yacon tubers. 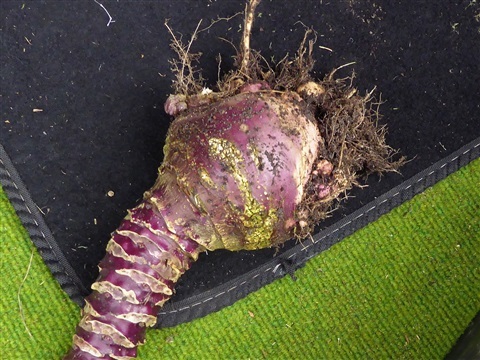 With the leaves affected by the cold, I decided to find out if there were in fact any decent tubers in the pots in the first place, before lugging them across from #146 to the tunnel on #145. 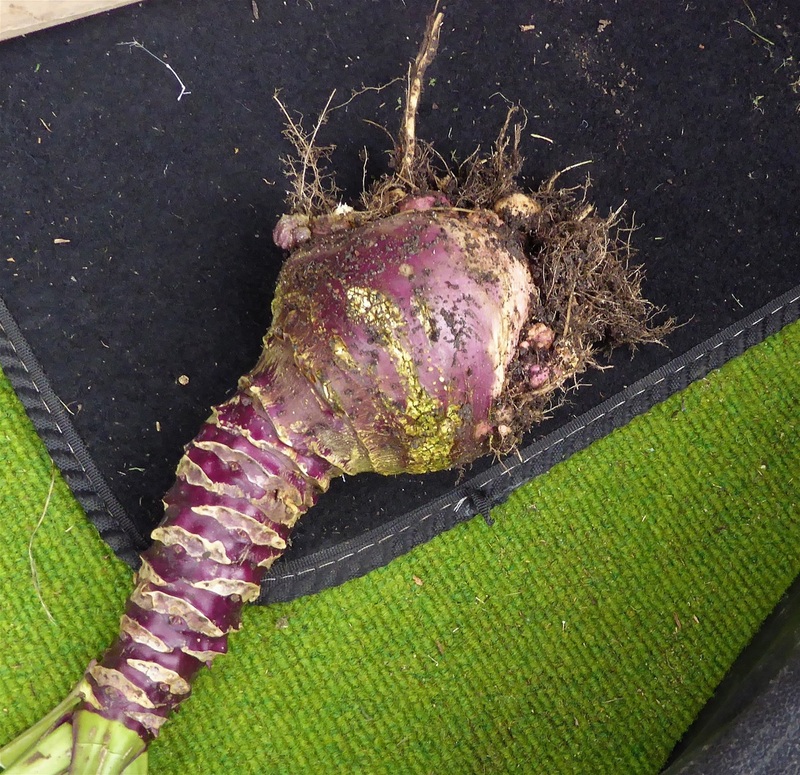 Much to my amazement, there were 3kg of tubers in the pot I tipped out!! Best to try them before going any further, so a small one was duly peeled and sliced... a bit like a juicy cross between a mooli and a pear in flavour but less granular than a pear. Cautious not to eat too much at once though, as the sugar contained in the tubers ... inulin... is the one found in Jerusalem Artichokes, which can have an unfortunate "windy" effect in some people, although it is a beneficial prebiotic and increases the absorption of maganesium and calcium too. 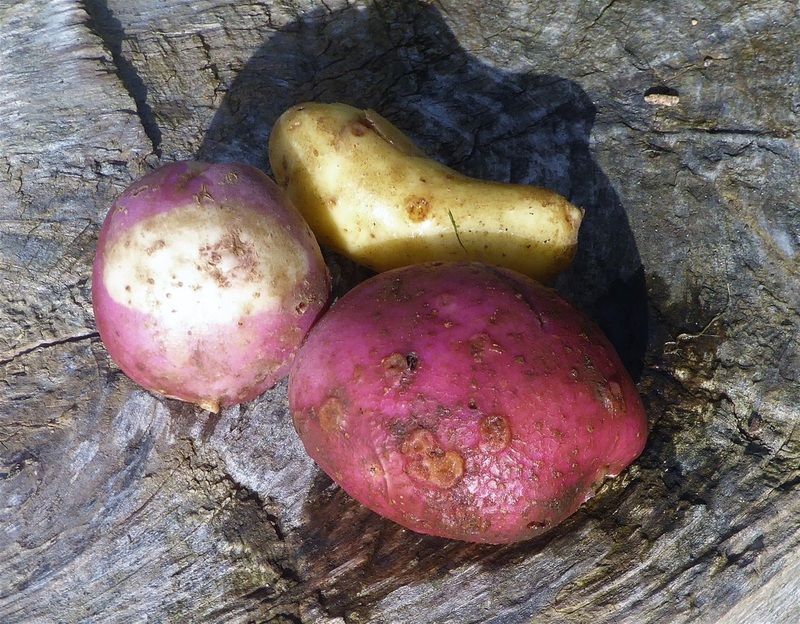 Yacon produces two types of tubers: the lareg storage tubers, which are the ones to eat, and the smaller ones with new growth buds on them. The top section under the ground has these buds, and so I have replanted this part in a 5ins pot to overwinter in the greenhouse at home. You can see it, with trimmed stems attached, to the right in the photo. 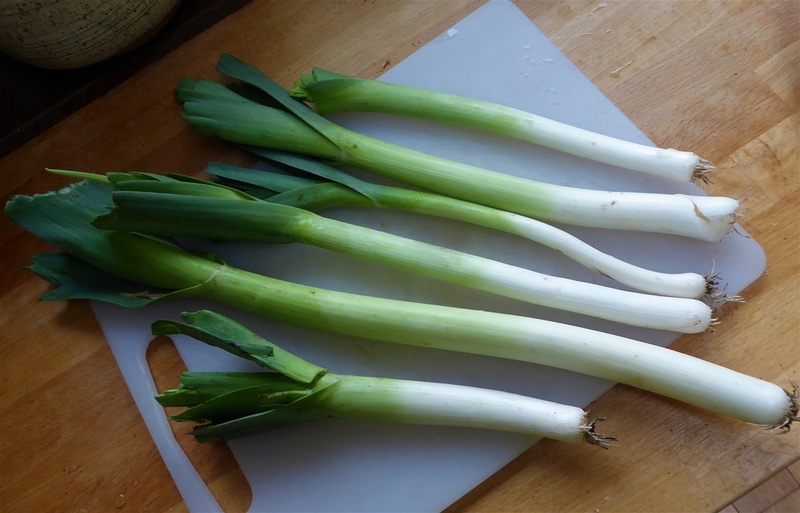 Another first for this season is Leeks. 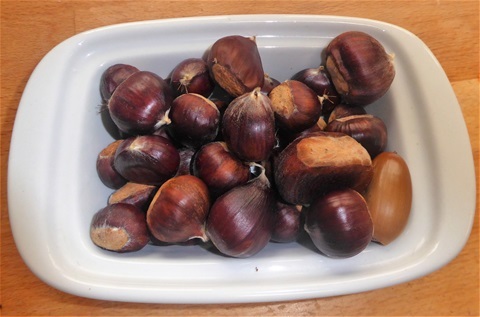 The earlier variety is large enough to harvest now, and were very tasty baked in cheese sauce. We hope there are enough to last us right through the Winter well into next Spring. Now that the threat of Leek Moth is past, the enviromesh has been take off, laundered and put away until it is needed again. This is such a useful material: I really cannot recommend it highly enough. Amazing how such large potatoes can be missed when the bulk of the crop was dug up! 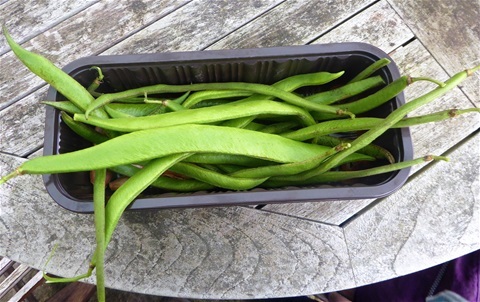 There was a surprise crop this week... runner beans! When I was taking down the bean poles to store away for next year, there were a couple of clusters of fresh young beans amongst the drying pods. We have never had runners to pick at the end of October before, and it is a bit of a measure of how unusual our weather seems to be right now, but how good was that? They certainly tasted terrific! 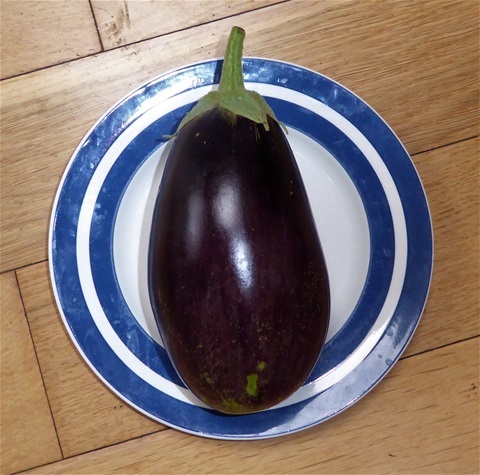 We have gathered the last of our meagre aubergine crop this year. 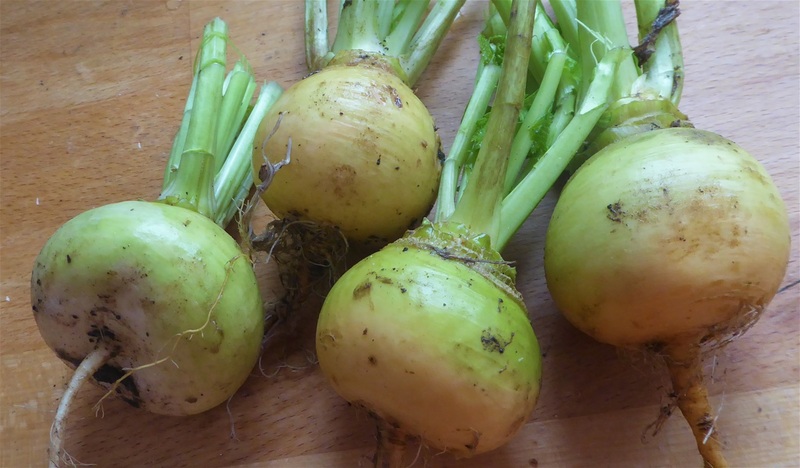 In some areas of the world this seems to be an easy vegetable to grow in large quantities, and even in England there are growing who succeed year after year, but for us, it is very hit or miss. This year has certainly been a "miss", which is disappointing given the new polytunnel, but I think I put the plants too close together, not realising how big they would grow when they were planted in the ground rather than in pots, and the polytunnel itself was too hot for the pollen to be viable for several weeks: better ventilation needed perhaps. And that is the end of our harvests for this week. Do check out what others have bene gathering, via the link at the end. 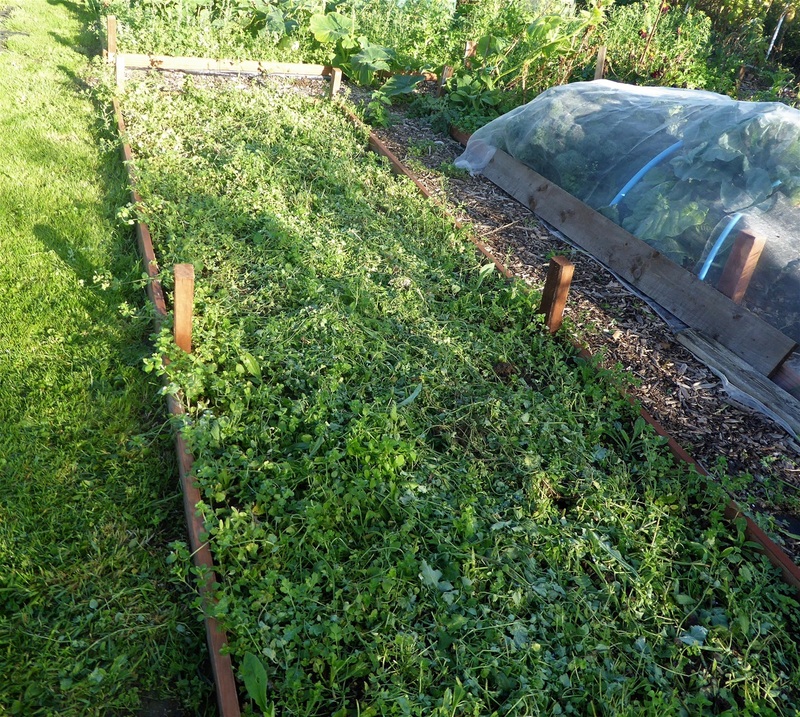 Well we decided to cut our losses, pull out by hand deep rooted perennial weeds like thistles or dock, before scything down the soft weed growth, together with the vetch itself, leave it to wilt and then dig it in before covering the ground with black plastic for the Winter. As you can see, there was plenty of plant matter to dig in, so although the whole idea of the nutrients brought up from deep in the soil by special green manure plants has not really happened, there was plenty of organic matter to dig in. 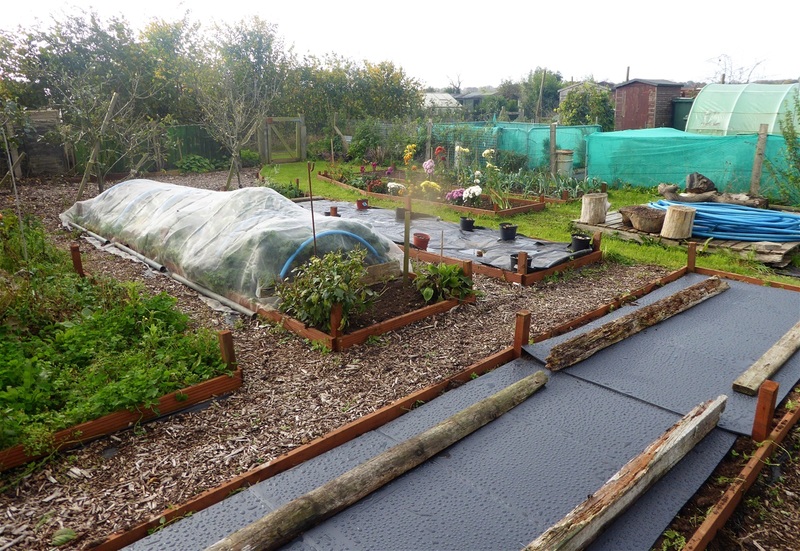 Three out of the four beds on #145 that we plan to cover for the Winter are now under wraps. We usually use thick black plastic sheeting, but earlier this year a friend gave us some heavy duty corrugated plastic sheets, which we are trying out. Water beads very evenly across the surface, which looks rather good! The last bed should be dug and covered in the morning, and then we can move on to #146, where there are six beds to cover. 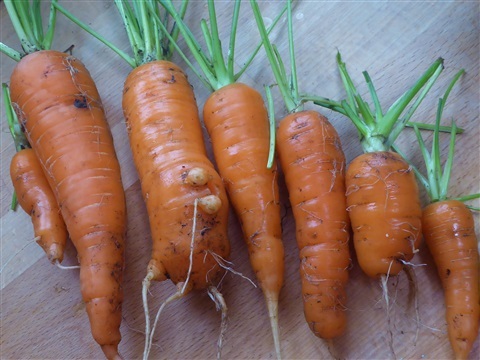 These will be much easier to deal with as the soil is much for friable after having had masses of organic matter added during the past seven years. 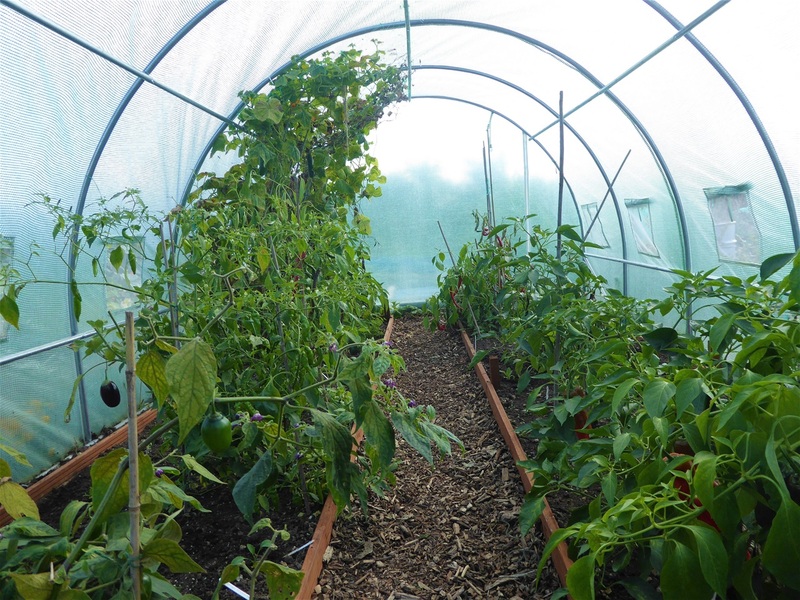 This is the polytunnel on #145, with the yacon plants in pots sitting on the path. We are still battling against the rodents though. Yesterday I noticed a large hole chewed through the cover by the door, probably by a rat or rats. I repaired it, and today there was no further sign of them, but we shall have to be vigilant with derterrants. Coming up the Hallowe'en, I thought I'd end with a photo of something made by some of our grandchildren: Ghostly Pears. 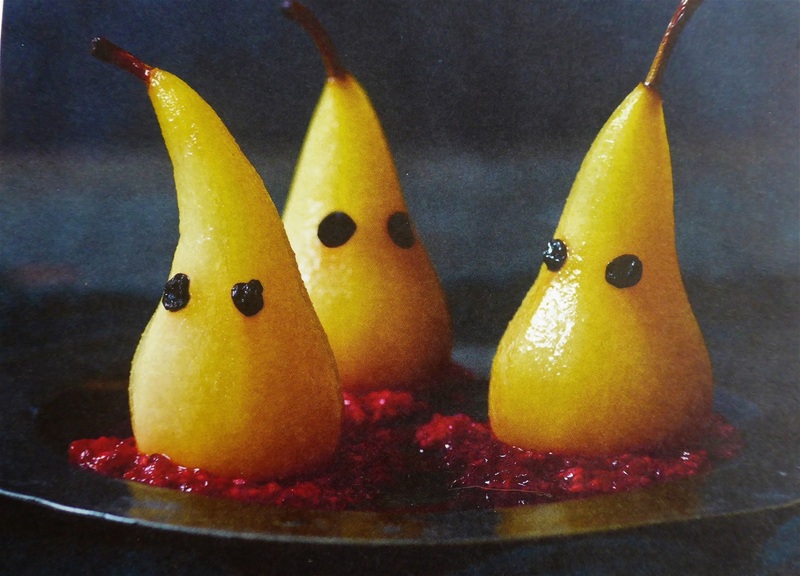 These were based on a Waitrose recipe, and are peeled pears, poached in a light vanilla-infused syrup, with dried blueberry (or chocolate chip) eyes, standing on a base of crushed fresh raspberry "blood". A good use for those soft raspberries harvested right at the end of their season! Thank you for reading this week's blog entry, and hope your preparations for the changing season are on track. I'll be back next Monday! Really proud of this cabbage! October 23rd - The Storms Abate and Autumn Planting Begins. Hot on the heels of Storm Ophelia came Storm Brian, but luckily for us here in the mid-south of England we escaped their strength and escaped with no damage to trees, buildings or flying cloches. Grateful indeed when you see how other have fared. 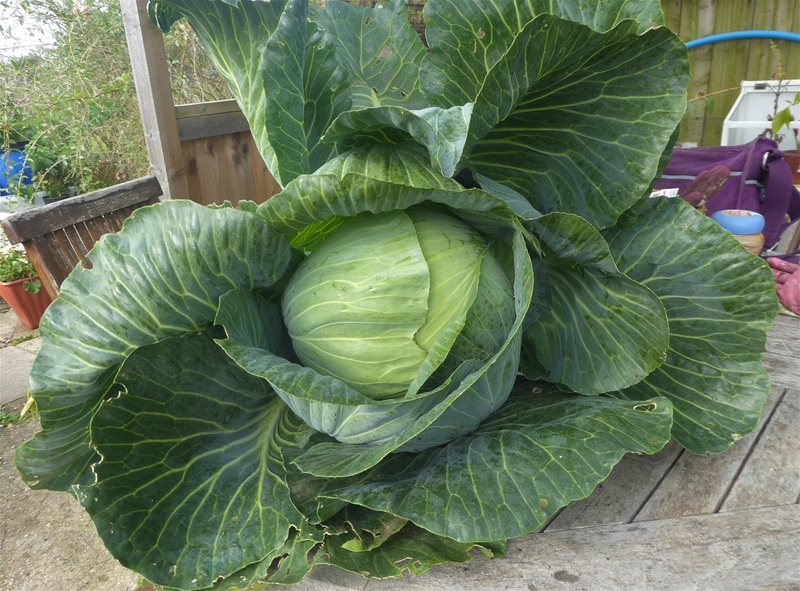 Before we talk about planting, let's start by looking at what we have been able to harvest this week, for Harvest Monday, including a real "first" for us: a large round cabbage!! This is one of the five plants we bought in a selection of club-root resistant varieties. They have all performed well, but these Kilaxy cabbages are the best we have ever grown. 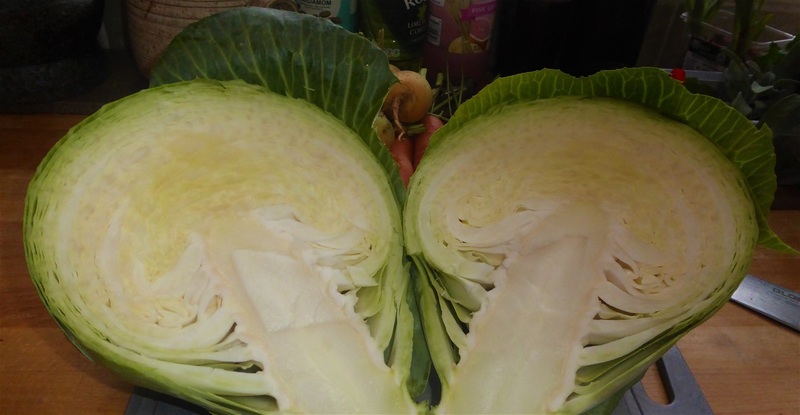 The blurb said they should grow to around 2kg in weight by the Autumn, and just look at this: 2.1 kg after it was trimmed: a solid head of dense white cabbage, which is really sweet and crunchy. 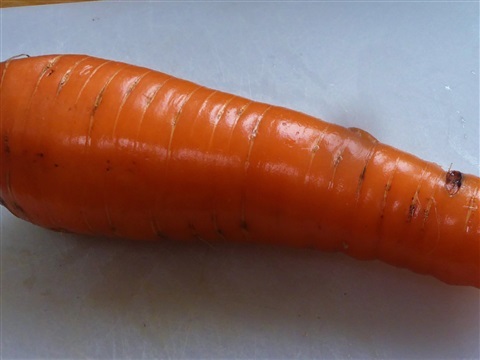 We had some last night with dinner, with dill seed and black pepper, some will be going to make a bowl of coleslaw and some to a pea, potato, cabbage & coconut curry. With four more growing it looks like we shall be well supplied with cabbage for the next few weeks! Growing under enviromesh has ensured no damage from caterpillars or pigeons, and has been well worth the small effort involved. I also planted them far enough apart too, which has helped. Usually I try to squash in an extra plant or two, but this year common sense, prevailed, plus some extra space of course with #145. 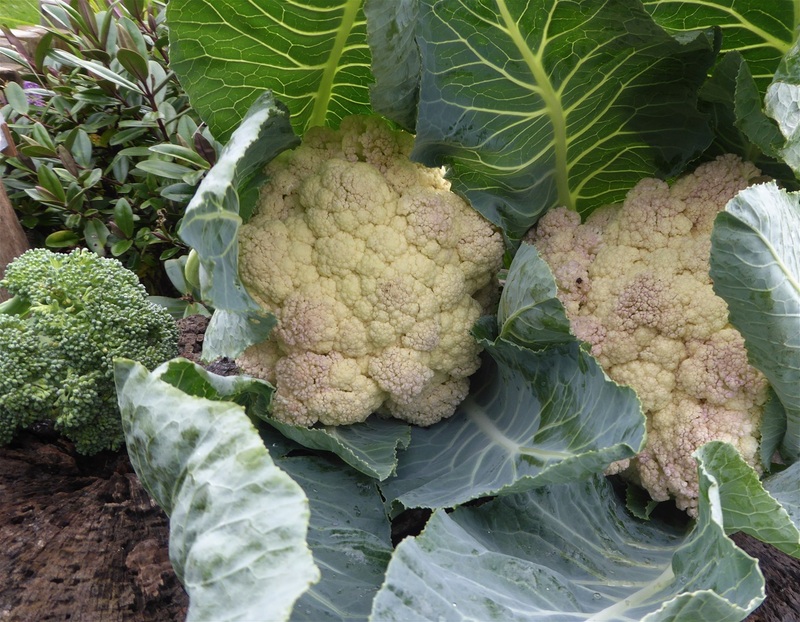 Talking of cabbages reminds me of the fermented cauliflower pickle, which spent two weeks sitting on top of the fishtank emitting rather alarming cabbagey smells, then three weeks down in the greenhouse as it was getting a bit much. 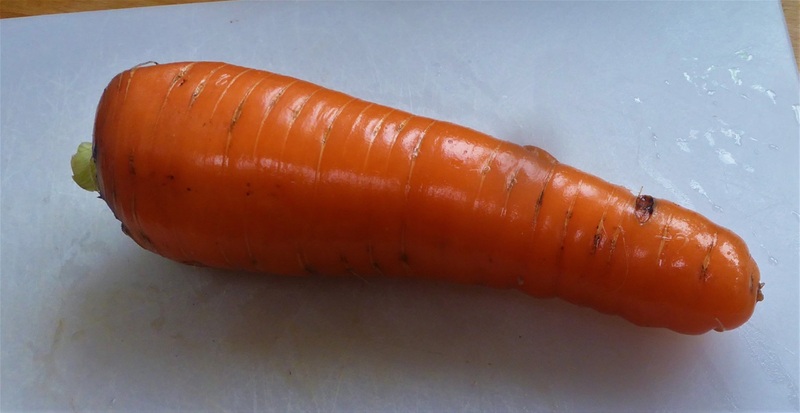 I tried some this afternoon and it has a good crisp texture with a decent bite of flavour from the spices. Could be a good accompaniment to a curry maybe? In the polytunnel, the Perpetual Spinach had a few leaves large enough to cut, and with some Red Mustard, Flatleafed Parsley and Coriander, added a lot of flavour to a stuffing for large mushrooms. The parsley has also garnished our chciken & courgette soup. 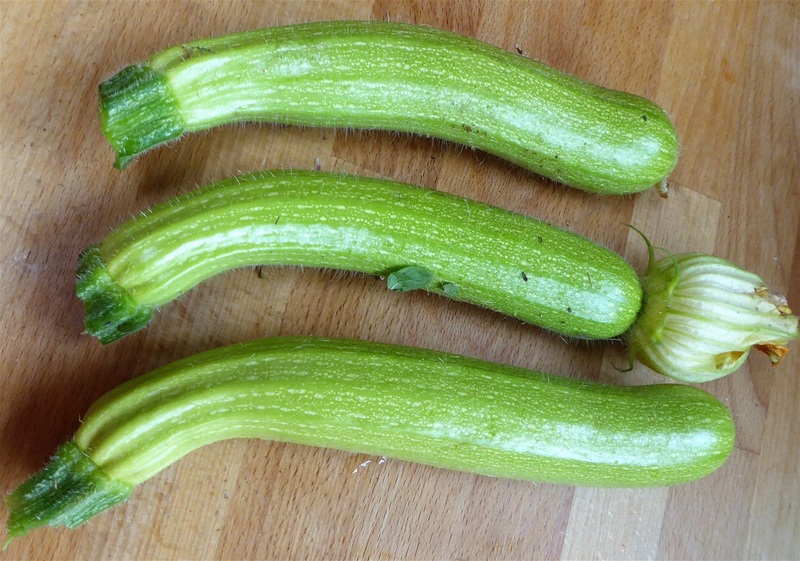 It is just getting to the point where courgettes are not greeted with quite such enthusiasm, but with only a week or two left, I am sure we'll cope! Mice are still raiding the beds, and the traps are certainly busy. The Red Tailed KItes swing by regularly to check out the verge where I empty the traps, and look fantastic when the sun glints off their russet coloured plumage as they swoop down to help themselves to a snack. I just wish we could get some photos of them in action! 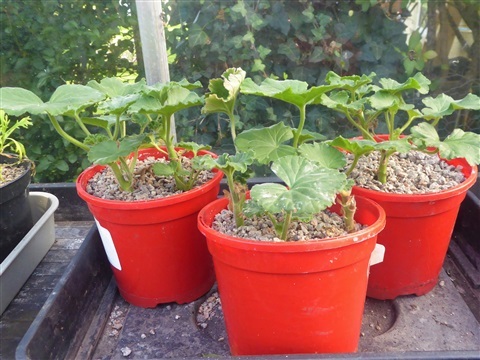 And of course cucumbers: the Diva plants in the polytunnel are not enjoying the chillier nights and flowering is slowing down, but at home in the greenhouse, the Telegraph plant has a new lease of life! This plant has been so successful that I am saving seeds for next year, and will be sharing them around too. These yellow cukes are ripening off nicely lying on trays on the floor of the greenhouse. You can see two are at least 60cm long. I thought it was time to cut open one of our small butternut squashes to see how they are, and decided to try a version of recipe from Dave: Butternut Maple Custards. I couldn't resist a little taste before they were fully cold, as you can see! 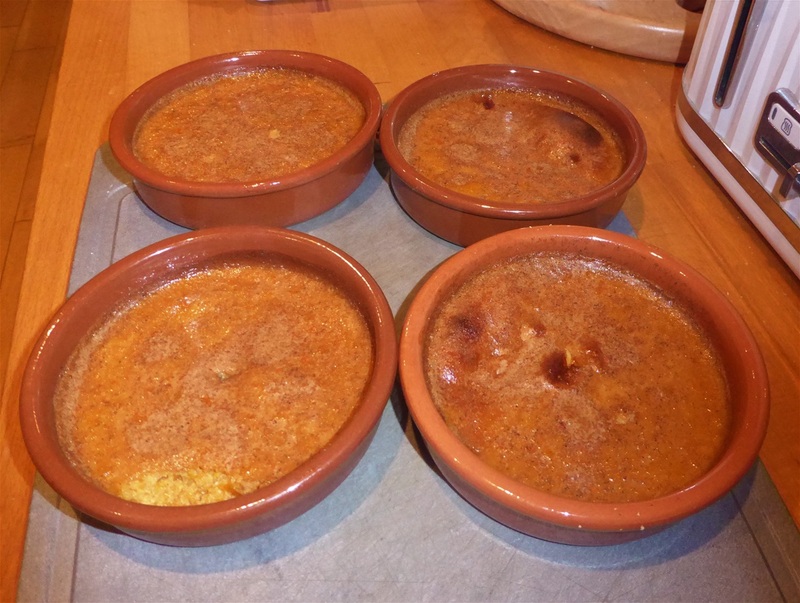 They could do with being cooked in slightly deeper containers really, but ooooo did they taste good! 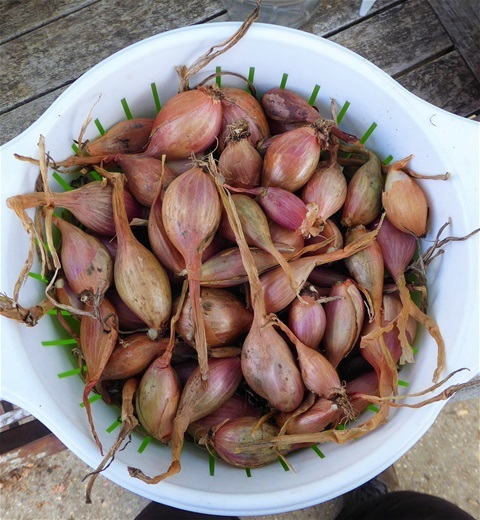 This week I have actually managed to find time to plant the main garlic crop out, which is quite a relief, as I like them to get some decent root growth in before the Winter, and the weeks are rushing by. I gave the soil a spot of Blood, Fish & Bone to help them on their way, and I hope to see green shoots in two to three weeks: they are down around three inches deep overall, so it'll take them a while to put in an appearance. The bed for the shallots and elephant garlic is now cleared, and I have sorted through the shallots in the garage to find the small ones to replant. The smaller ones seem to divide better for some reason. Last season I planted them too close together so it was difficult to weed, and forgot to feed them too, so there were quite a few small ones. Lesson learned! 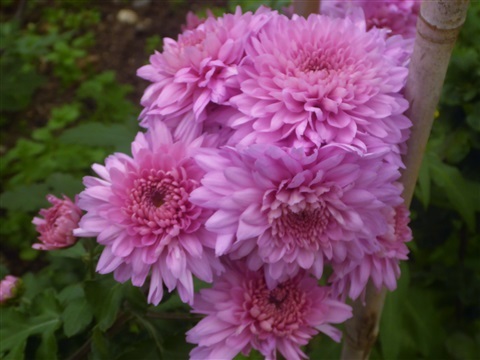 I am growing a variety called Jermor, which are slightly elongated and have a nice pink tinge to the flesh. 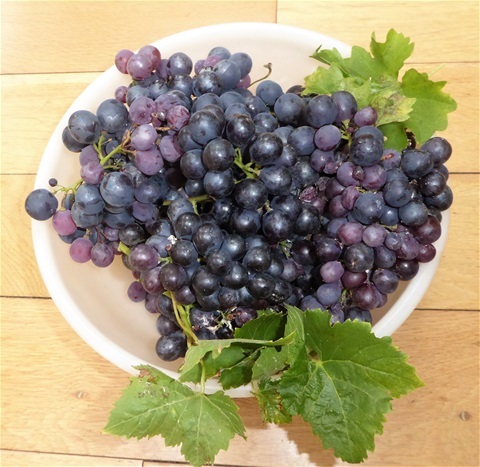 We like their flavour too, and use them in all sorts of recipes where their mild sweetness can be appreciated. I gritted my teeth and cleaned out our greenhouse at home. It is a job I dislike, especially cleaning the glass, as I get dripped on, covered with spider webs and scratched to pieces by the brambles along the hedge, but ....the glass is now sparkling inside and out, the brambles cut back, all the pots and trays are clean, neatly stored so they are to hand when they are next needed, tools are cleaned and oiled, and all the "gubbins" that hangs around has been assessed as to its genuine usefulness and most of it taken to the local tip. Abi has replaced the rotten section of the staging, and got the temporary staging ready to bring in, once bubble-plastic insulation is up, and then we can start to move in the tender plants. Pleased to be a bit ahead of the frosty nights: some years I have been carrying in pots of plants by torchlight as the frost settles on the grass, and not only is it not much fun, it makes putting the insulation in very tricky. I have even checked that the heater still works! The cuttings I took a few weeks back are looking healthy. 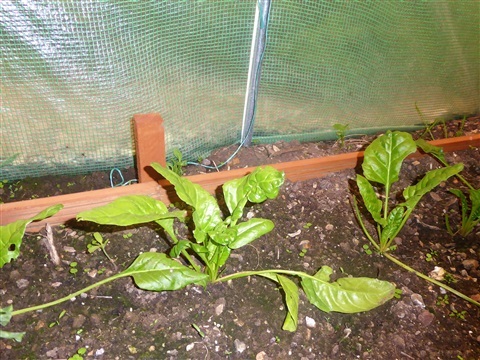 I think they will need to be transplanted soon though, so they can continue to grow, albeit slowly, over the Winter. I grew some pink Agyrthemums like this last year and they are still in flower in troughs at the plot. 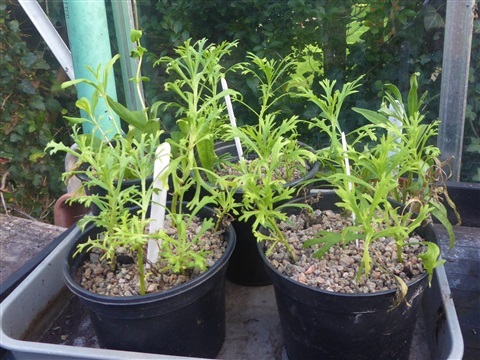 Overwintering cuttings takes far less space than keeping mature plants, and they will soon grow away once the warmer weather arrrives. And to end this week, we have some "new" flowers, these highly perfumed Pinks. We bought some tiny rooted cuttings back at the start of the Summer, and they have grown into nice hummocks of leaves, with lots of flowers. They are all white, which was a bit of a surprise as they were supposed to be mixed colours, but they are still very pretty. 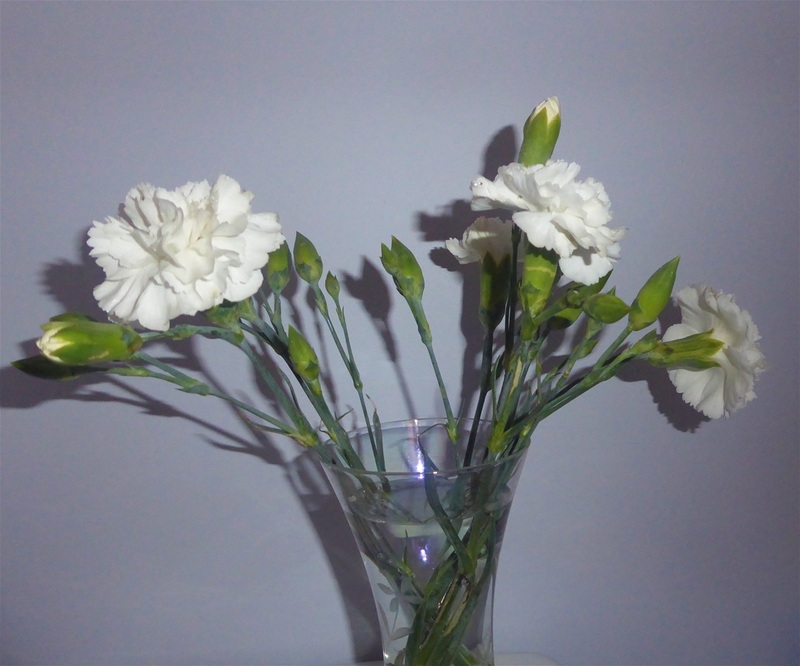 This small posy scents our shower room beautifully... and if anyone wonders why white flowers are called PInks, it is because the edges of the petals look like they have been trimmed using pinking shears. I shall be back next Monday, hopefully with lots more clearing up done on the plots and the insulation in the greenhouse... we shall see!! 16th October - After another week away, it was business as usual today down at the plot, despite the strange weather conditions provided by Storm Ophelia. 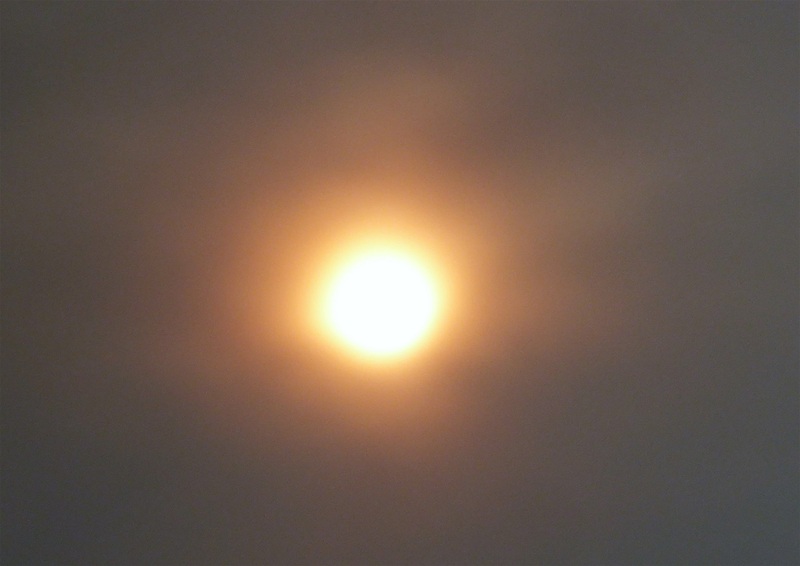 Dust drawn up by hot air across Europe and the Sahara during the storm's journey towards the UK, resulted in the sun looking a very eerie colour around mid-day ... a reddish glow through darkened clouds. Not a drop of rain though. Here in the south of England we will escape the worst of the storm I think, but it does bring back memories of the devastation caused by a hurricane here 30 years ago. 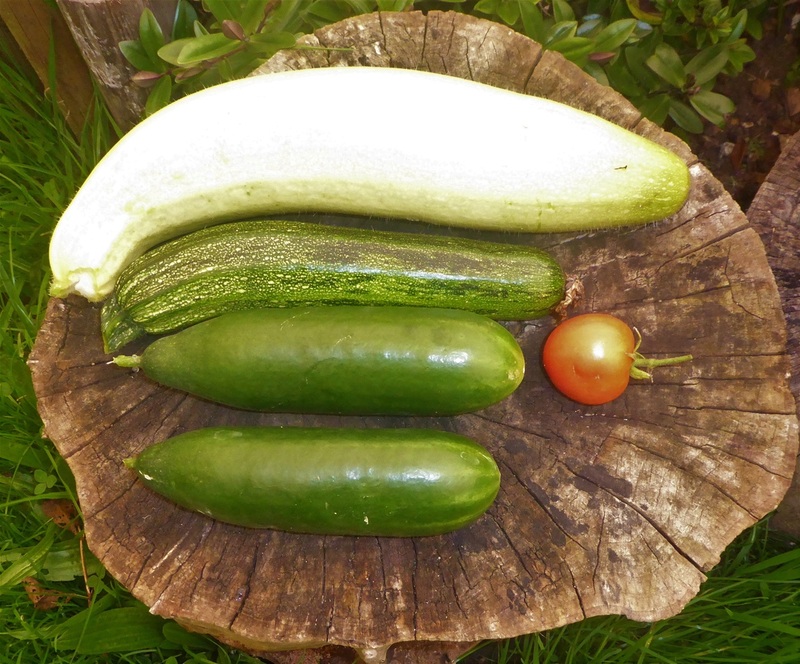 Harvests this morning included courgettes and cucumbers, plus a single tomato from the Crimson Crushes still growing outside. There are still a few green fruits too, and if the weather stays as unseasonably warm as it has been during the last few days, they may even ripen outside. We were lucky enough to be given some raspberries and Ashmead Kernel apples by some friends, to add to the feast, as well as some of their home made raspberry jam, so came home very happy indeed. 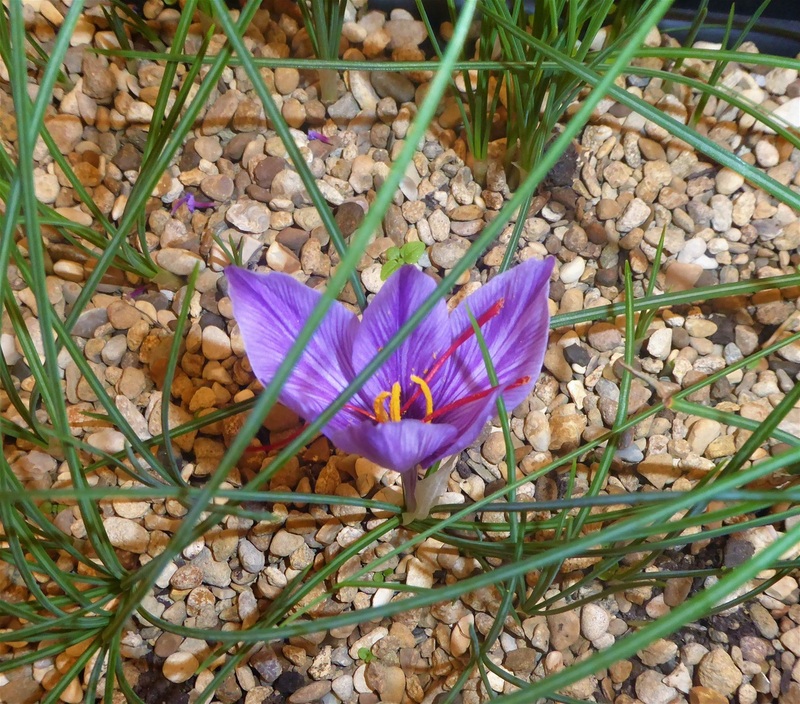 In mid Summer, when the corms were dormant, I dug up the saffron and replanted it in sandy soil in deep troughs. 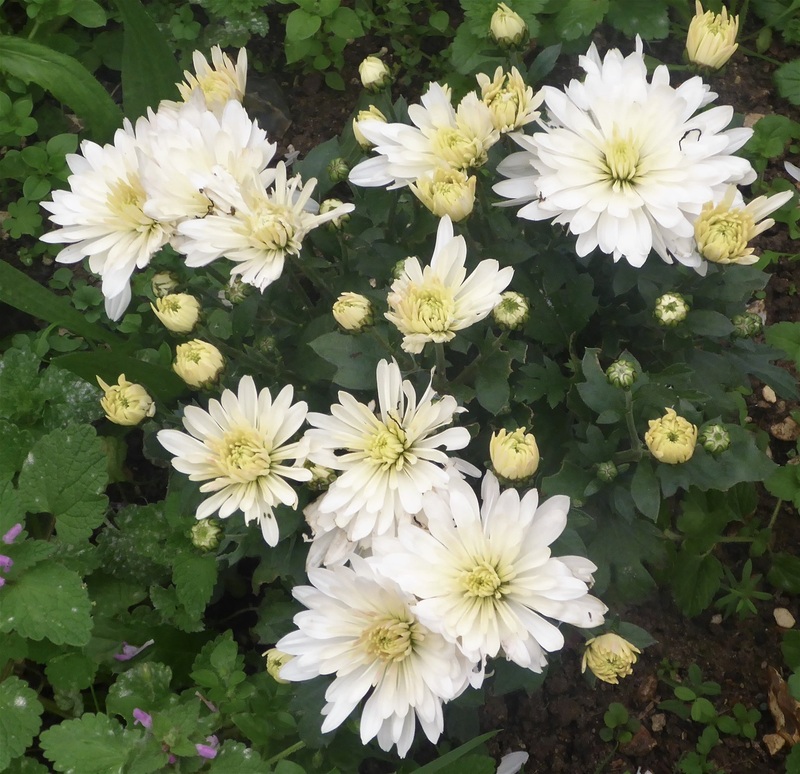 Using a whole square metre for it, when it is only above ground for a short while, meant keeping what looked like an empty bed weeded for the rest of the year while we admired the label, so they are happily rehomed. The first flower was open today, and you can see the three huge red stamens which are the saffron itself. These were carefully removed and are stting in the kitchen on paper to dry before storing. Last year we had 15 stamens, so I hope this year for a few more perhaps. There is just one more harvest for this week, which was a bit of a surprise in more ways than one! 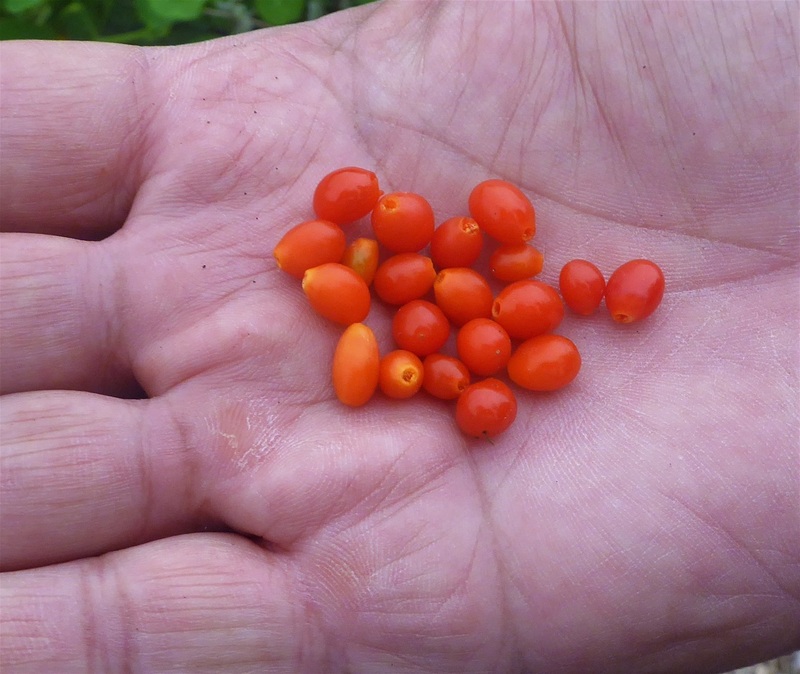 Our Goji berry bush in the hedgerow behind #146 has given a bare half dozen berries over the years, and these have been pretty sour and unappetizing, so we had decided to cut it right back and maybe even dig it out if possible. 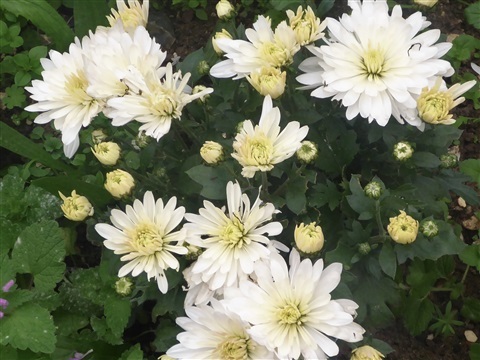 This is the first year we have grown chrysanthemums at the plots, and with the extra space #145 has given us, they have a whole bed to themselves. 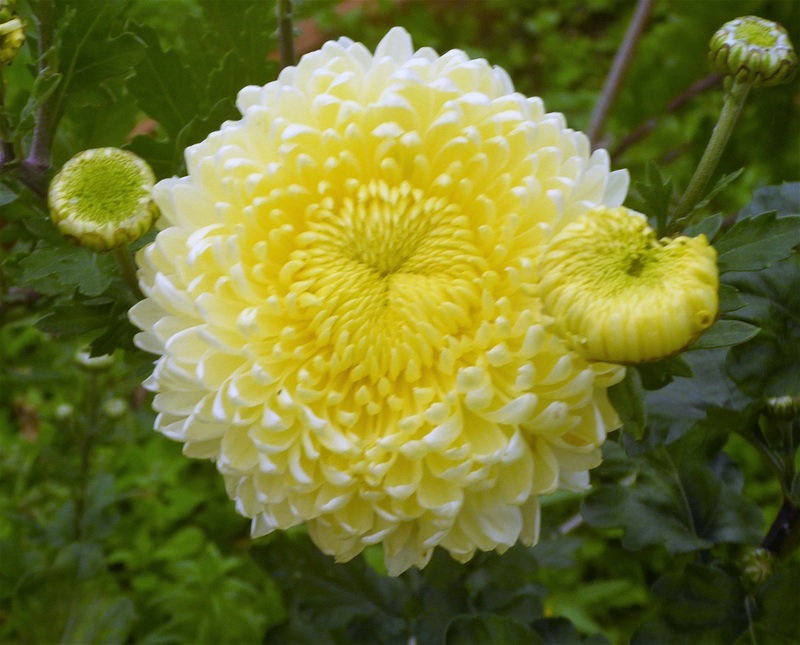 We bought plug plants of three different kinds, and although the type called "Bloom" need the smaller flower buds removed to develop the huge florist-style flowers, we let them all just grow. Abi staked them (Thank goodness, given the storm forecast tonight) and now they are rewarding us with some very pretty flowers! I am very fond of the bronze coloured spray flowers, as they remind me of the Bonfire Nights in my childhood. 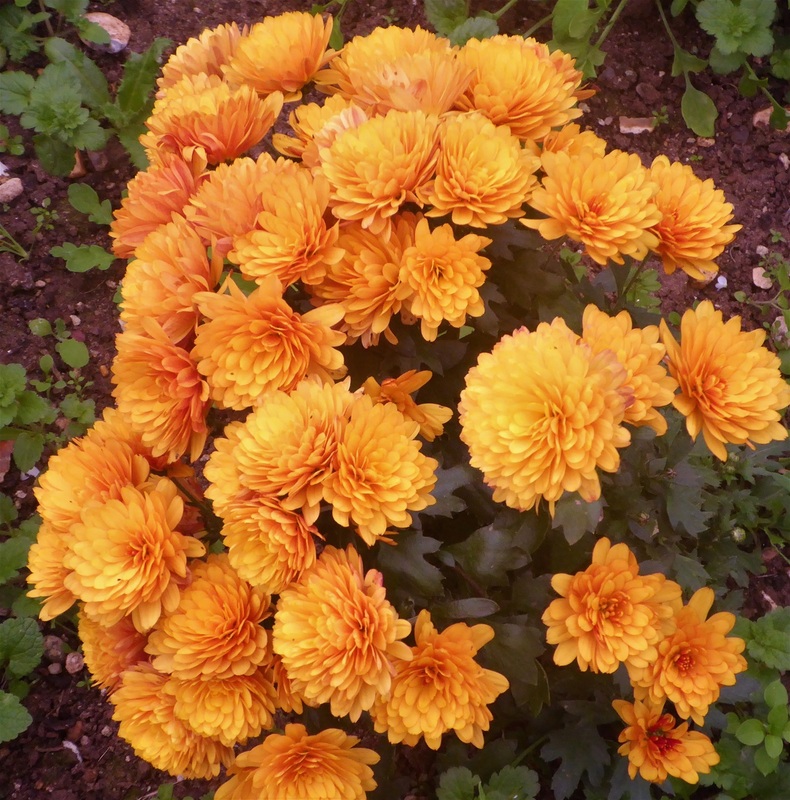 Dad would build a huge bonfire in the garden every year, and the flowers would open in the heat from the flames. 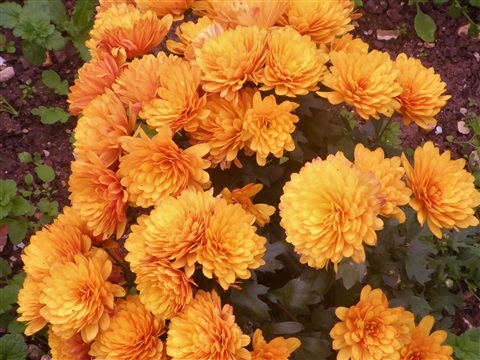 The distinctive smell of chrystanthemum leaves and the sight of those orangey flowers takes me right back to crisp cold nights watching fireworks, with my face scorchingly hot and my feet achingly cold, eating potatoes baked in the hot ashes of the bonfire, with melted butter running down my chin. 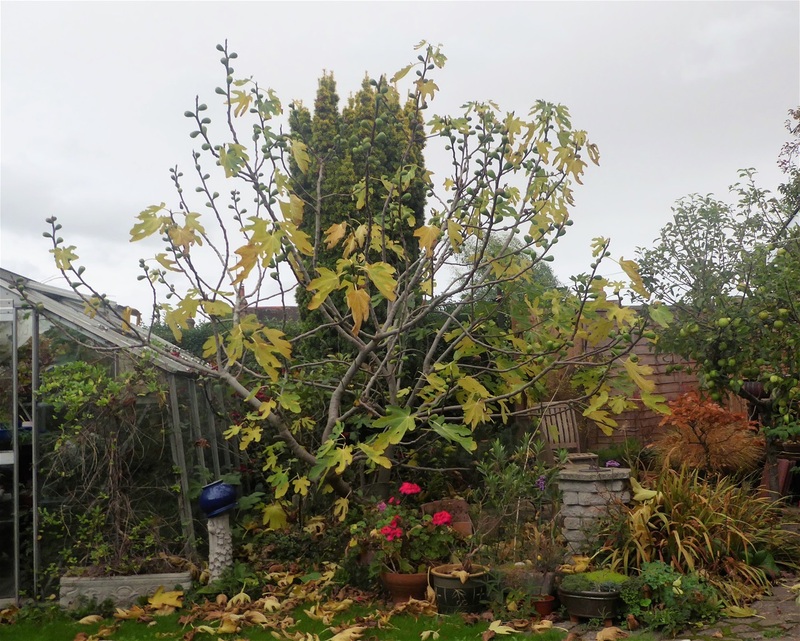 As you can see, the branches now completely overshadow the greenhouse, and restrict our access to the end of the garden, so it is time for a good chop. The best time to do this is when the tree is dormant, and shedding leaves is a signal that the tree is going to sleep for the Winter. Pruning back the branches will remove the fruit that will not ripen, which saves us getting covered in latex taking them off one at a time, but sadly will also remove the tiny budlets right at the ends of the branches, which would form next Summer's crop of juicy figs. We shall have to sacrifice a crop next year to be able to use the greenhouse and the far end of the garden again, it seems! 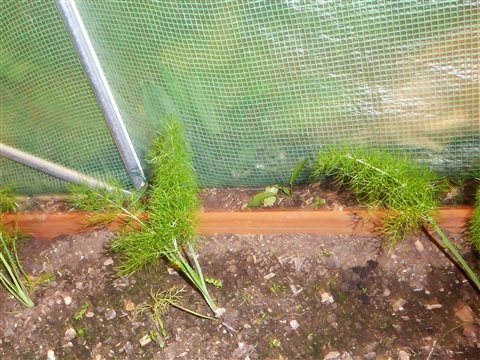 Two weeks back, I transplanted Perpetual Spinach, Fennel, Red Mustard and Florence Fennel, all of which are growing away nicely. They had attracted unwanted attention of mice and voles, but the traps have reduced their numbers a bit, and the plants have grown lots of new leaves. 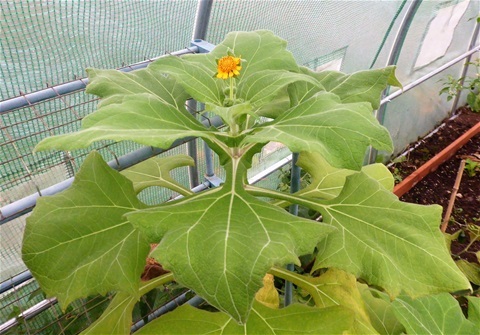 The Yacon plants are in flower now. This one is in the polytunnel, and tomorrow, with the help of thr wheelbarrow, I shall move the other four large pots under cover as well. 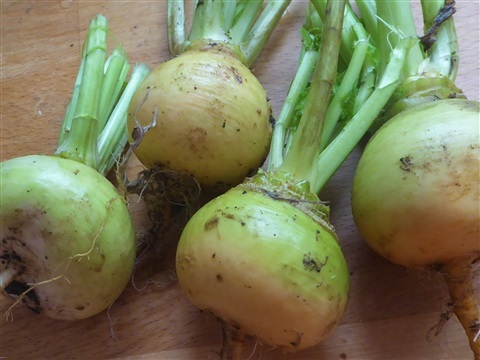 I shall leave tipping out the tubers until the leaves have died back, and I hope that moving the plants will give them an extra week or two of growing time, fattening the tubers still further. Thank you for advice about using and storing these: it is really helpful to know they discolour quickly when cut and need to be dipped in lemon juice immediately to avoid this oxidisation, and that the tubers only store in good condition for two or three months, stored in damp compost. Despite the warm weather... it was 22°C today... frosts are not many weeks away, and it takes quite a while to move or otherwise protect all the vulnerable plants, so it is time to make a start. Cleaning the greenhouse at home is always a major job, and this is also on my list for the coming week. I am sure that lurking under the staging are all sorts of bits and pieces I shall never use, or would use if only I remembered I had them, so evicting it all would be a good move! 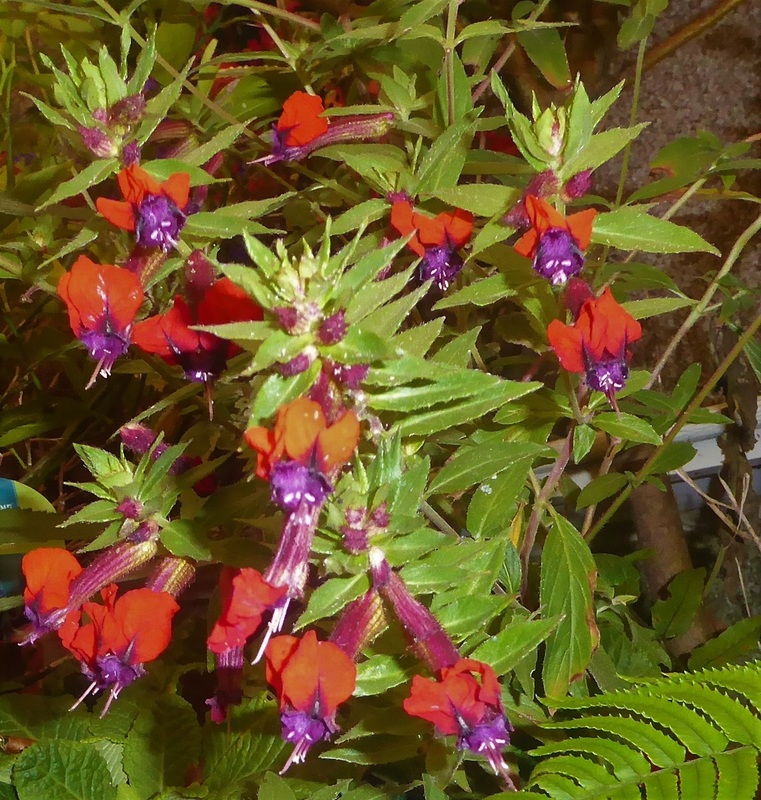 Sometimes I spot a plant languishing in the Bargain Bin at a garden centre, and give it a fresh start in life: this Cuphea plant has certainly repaid the 50p spent on it some months back. It is often called Tiny MIce, as the flowers are thought to look like a purple mouse's face with big red ears. It is a half hardy perennial, so I plan to move it to a small pot and trim the stems back to overwinter it alongside our fuchsias, hoping in this way it will grow into a much larger plant next year. And that is where I shall finish today. Thank you for reading the blog again this week!! 7th October - Another early blog!! I am away again next week, so decided to take no chances with wifi connectivity, and blog for this week today. There has been some glorious weather during the week, which gave me oppportunities to really get to grips with the weeds, and #146 is now looking much more purposeful. 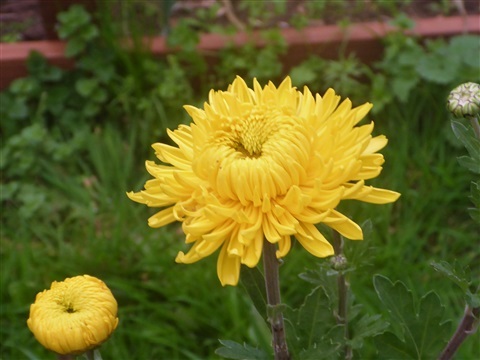 Deadheading the flowers and removing those that are spent has helped a lot, too. 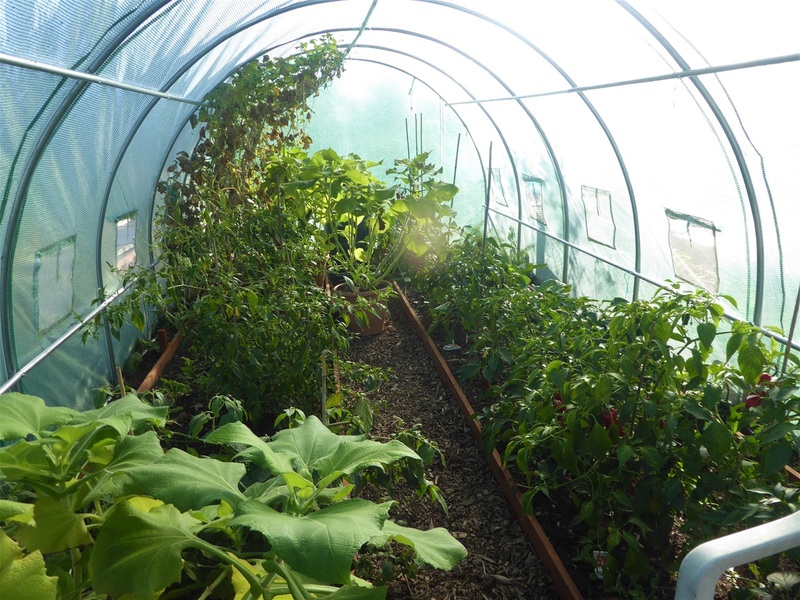 There have been big changes in the polytunnel, with all except one of the aubergine plants now out, and Red Mustard and Hispi Cabbage seedlings in their place. A little sprinkle of blood, fish & bone and the soil was good to go. They don't need too much nitrogen at this time in the year as their leaves will be bit too soft to stand the Winter cold. Two colours of chilli jelly this year! 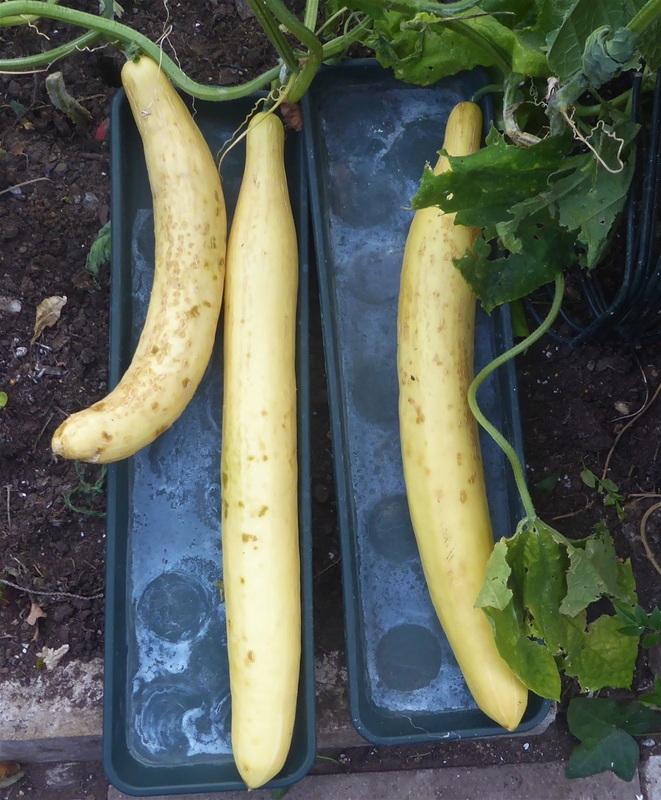 Over on #145, the Lady Godiva squashes are starting to change colour now, so give it another week and they could maybe come in. 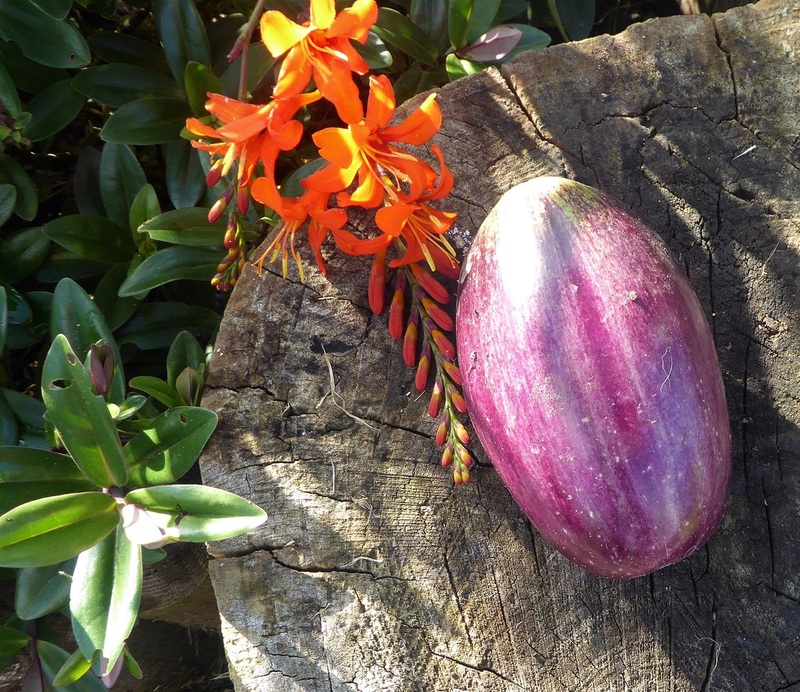 The single Queensland Blue plant has decided to make a bid for world dominance, but it is a case of too little, too late, as the fruits it is now happily setting have no chance of growing to any size, let alone ripening. A friend with a plot across town has found the same with hers this year, so it is definitely not on The List for next season! 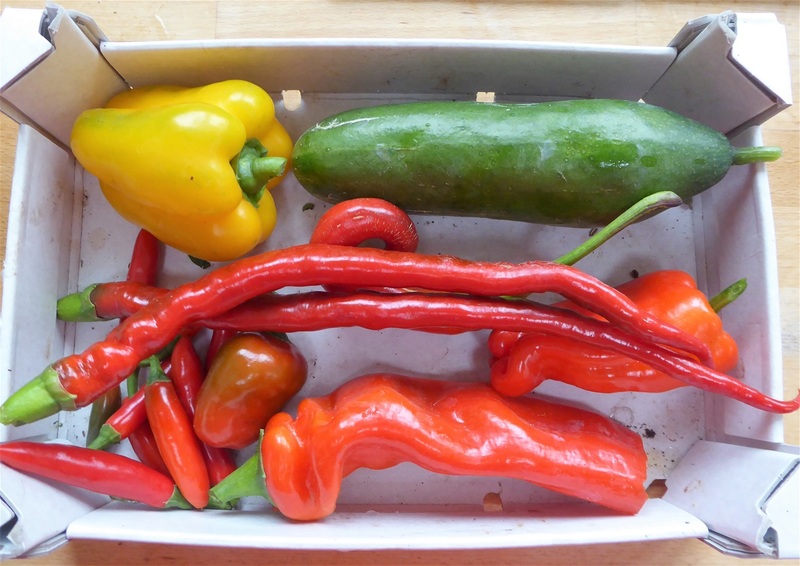 Harvests this week have included cucumbers - given twelve to other folk and still had enough for us - sweet peppers (Lovely crisp yellow ones this week, to go with the reds and greens) - chillies of course, including the first two ripe Albertos, and courgettes. 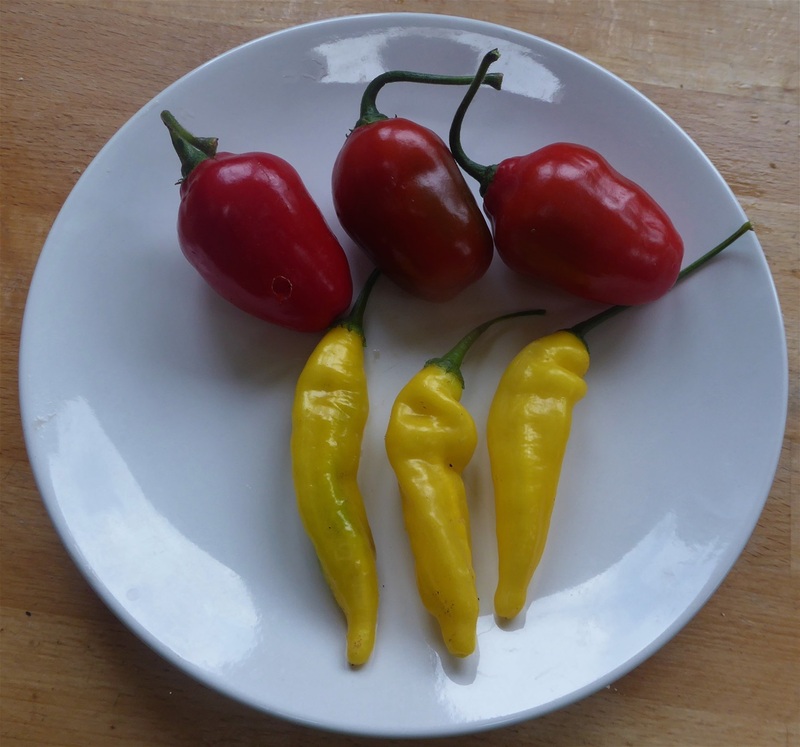 I said last week that the Lungo Bianco plant had come back to life, and these three were picked just now. There are still more developing, so weather permitting we could come home to more. I hope frosts do stay away as I could then harvest more nasturtium leaves. Glad so many of you liked the pesto recipe! The Oregano oil experiment didn't come to much, so I have picked lots more leaves, spreading them out on paper on the dining room table to dry slowly. I can then put them in a jar to keep, and it'll probably be more versatile than oil anyway. The fermented cauliflower pickle has mellowed a bit, but there is still a lingering odour of cabbage, so the containers have been banished to the greenhouse for next week. It tastes quite nice though! 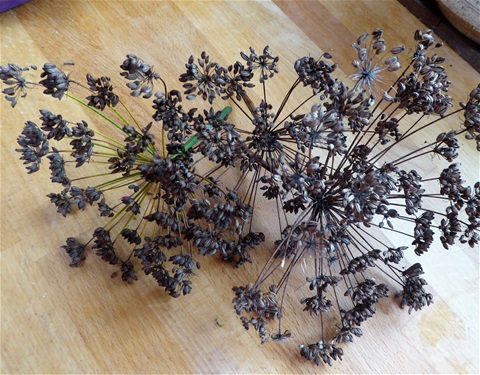 I cut more fennel seedheads and cleaned off the seeds to keep. 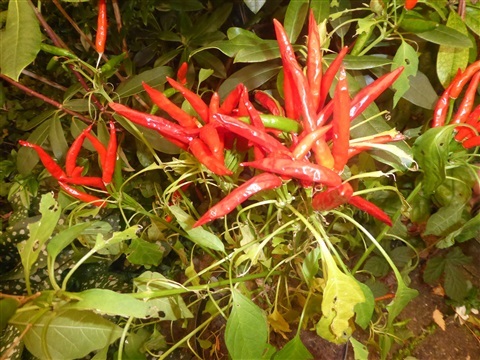 These are such a useful addition to all sorts of curries, stews, vegetables dishes etc that one jarful is never enough. Lots are still green on the plants though, so plenty more to come! 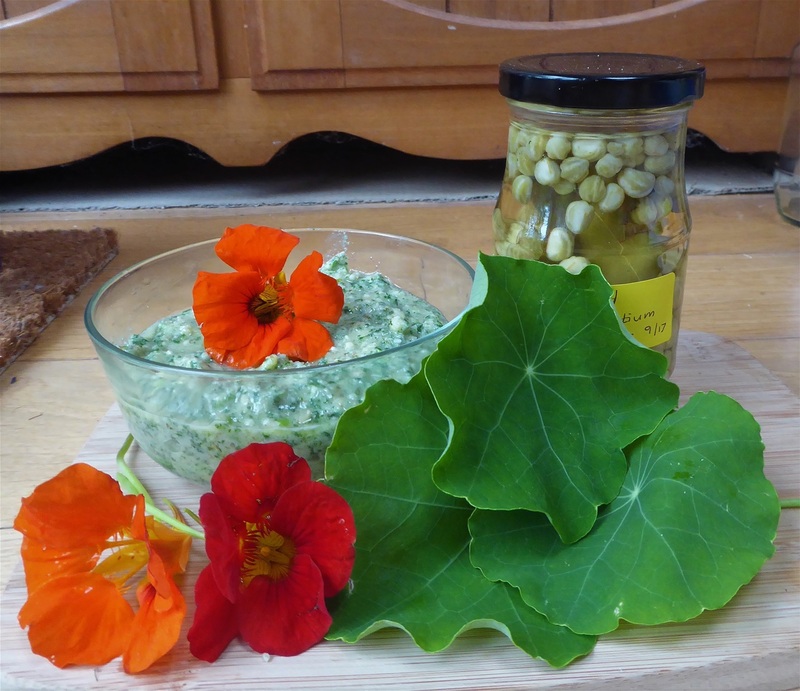 The poppy and dill seeds harvested last week have been cleaned of little pieces of stem etc and are now in their jars in the cupboard, and the jar of pickled nasturtium seeds has been topped up too. The nasturtium bread never happened though, because the dough just refused to rise, so I made some flat breads with it. These were tasty enough, but I would have preferred risen bread. Weather permitting, I might be able to have another go on our return. Hope so! I do like to finish by sharing some photos of our flowers. 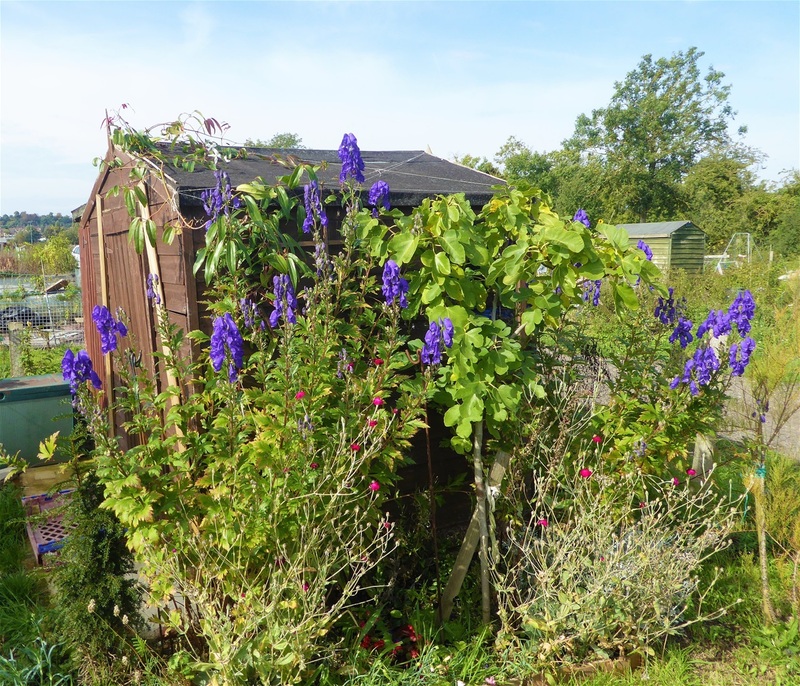 Here, in all its glory, is the Monkshood, standing taller than the shed! It is a real blaze of colour, especially since even more flowers opened in the sunshine, after I took this photo earlier in the week. Several passers-by have asked me what it is, and requested some seeds. I have pointed out that it is poisonous, but it didn't put them off. I have never seen one this height and can only assume it is because it is in full sun, sheltered form the prevailing wind by the shed! 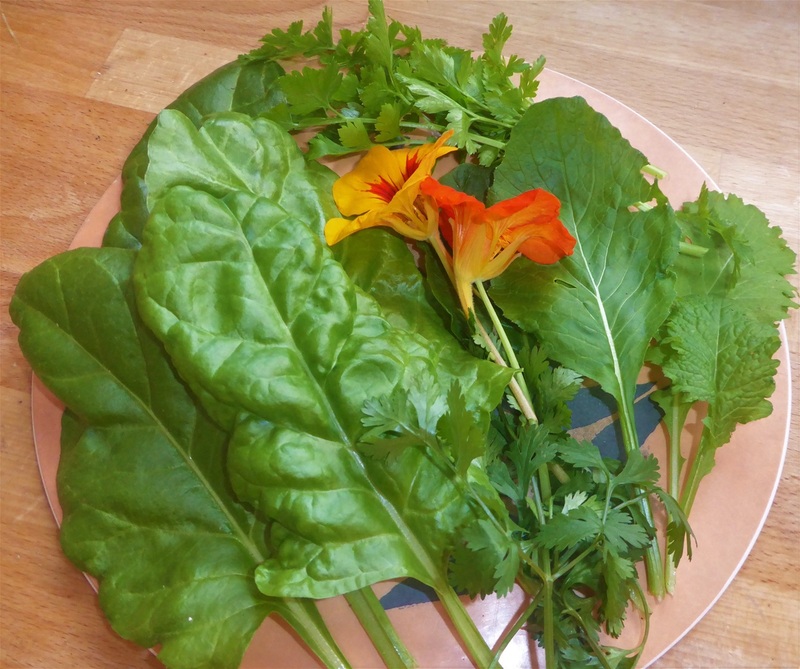 There was really good news on our site this week: the arrival of new plot holders, some of whom have already made huge inroads in clearing their plots. So good to see these being worked again, as they have been unloved for a while now. 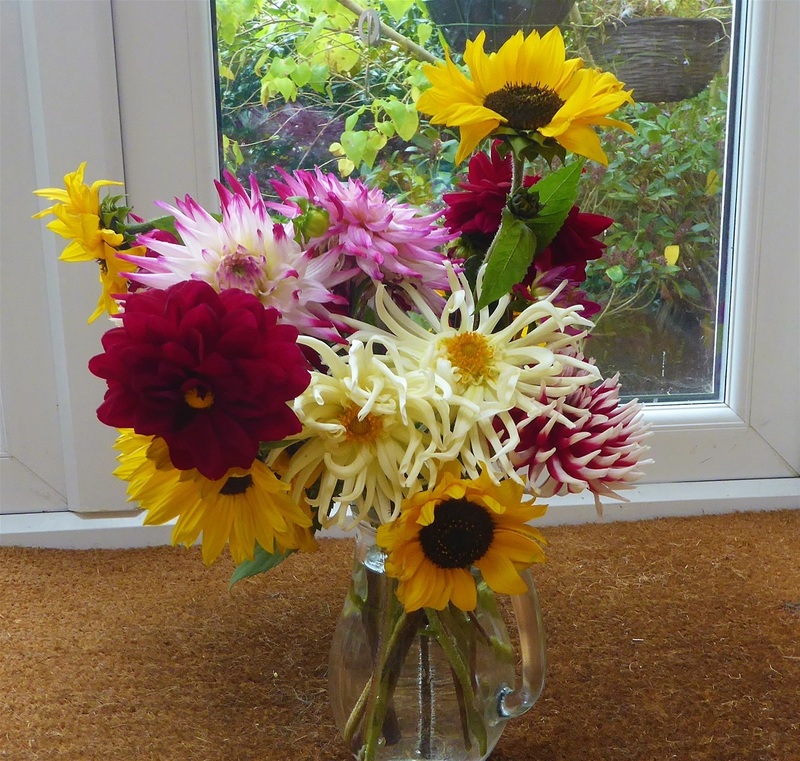 And last of all, here is a vase of the flowers I cut as we left the plot earlier: they have not been arranged, just put in the vase temporarily as our son was taking them home with him. These are the last of the sunflowers for this year, which is always a bit sad as they bring such bright splashes of colour across the plot, visible right across the site. 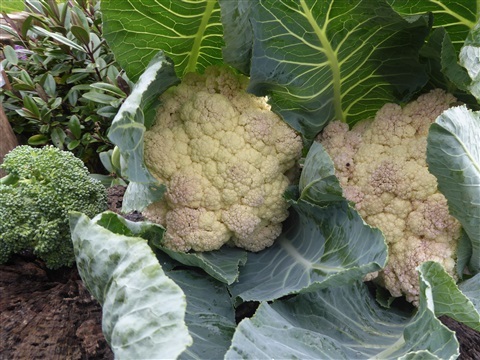 Next year though, I shall try to find some multiheaded mid-height varieties, as the huge ones struggle to stay upright on our windy site. 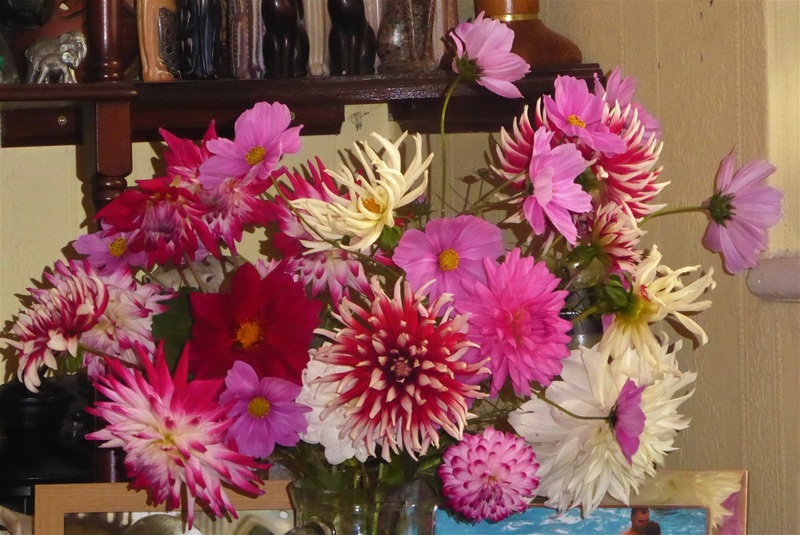 The dahlias have been a great success again, and this year we shall dig up the tubers and bring them home to store, after last year's disaster, when we left them in the shed and they froze and died. 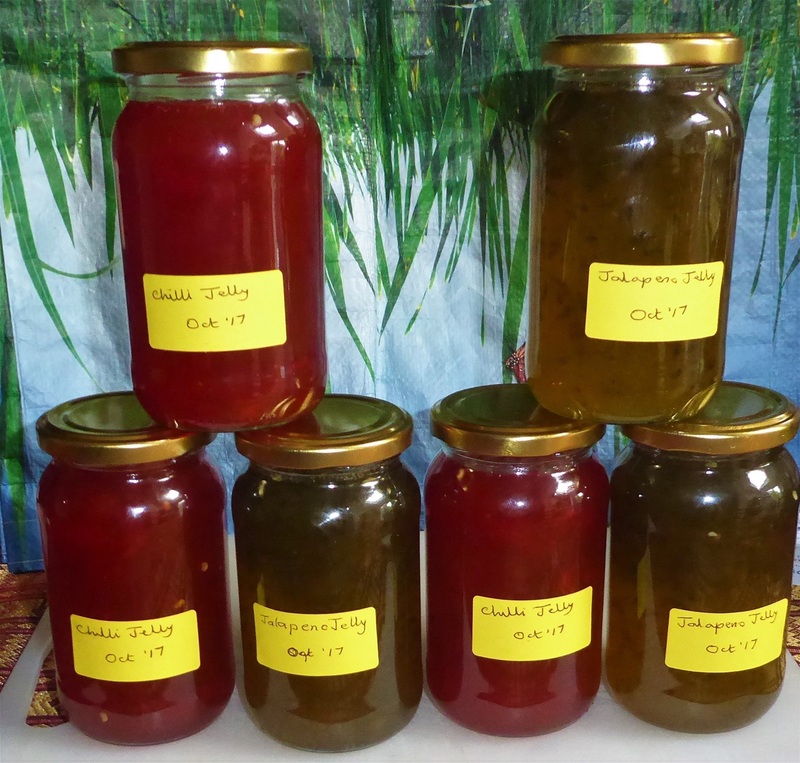 I'll post the recipe for chilli jelly shortly. Thank you for all the kind comments on other recipes, and for suggestions for variations too. 2nd October - A week of preserving! Harvests are certainly fewer, but what we have gathered is keeping me busy in the kitchen alright. It seems there is always one pan or another there on the stove top, and I am rapidly running out of jars to use. Harvest Monday begins with a surprise star: Nasturtiums. They are at their gorgeous best right now, with masses of bright flowers glowing in the sunshine.... but..... they also have given three different edibles this week. 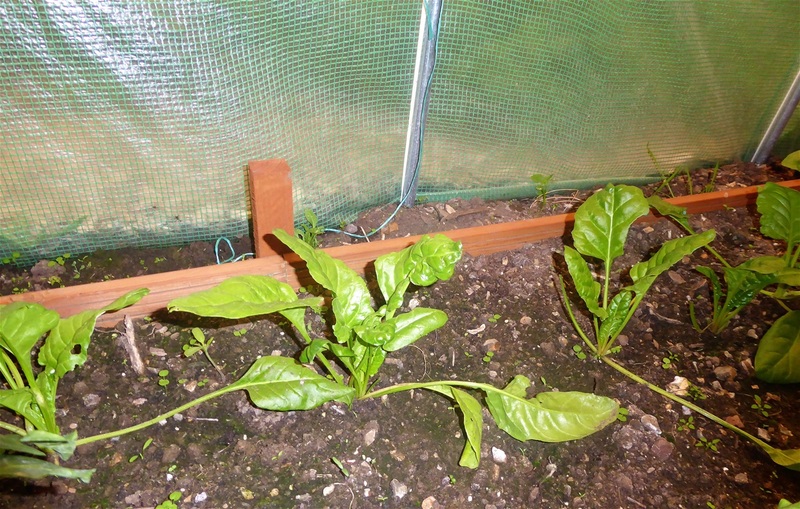 First are the leaves, which make excellent pesto, which will accompany our pasta and chicken this evening. Second are the seed pods, a good substitute for capers. 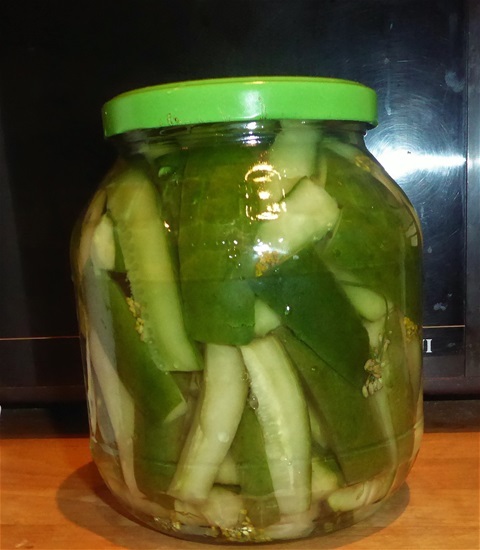 Salting and pickling them does reduce the sharp fieriness somewhat and they last well in a cool dark place. There is still some space in the jar for more to be added in a day or so. 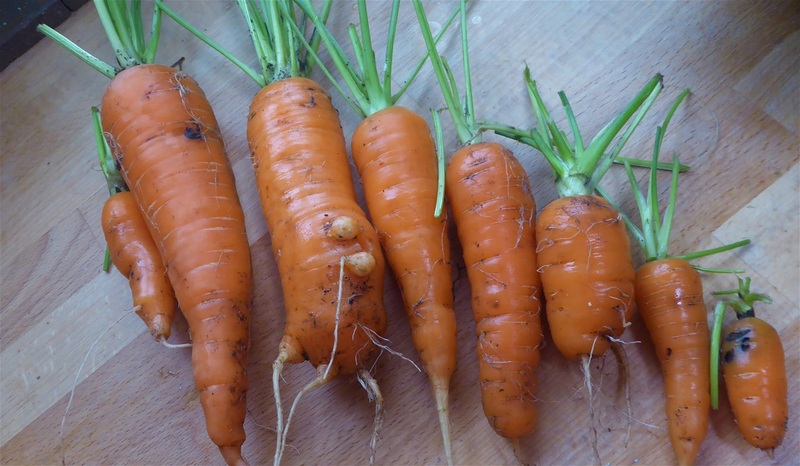 You do need to make sure you leave any yellowy ones behind, as the hard seed coat will have started to develop, making them a bit on the chewy side. 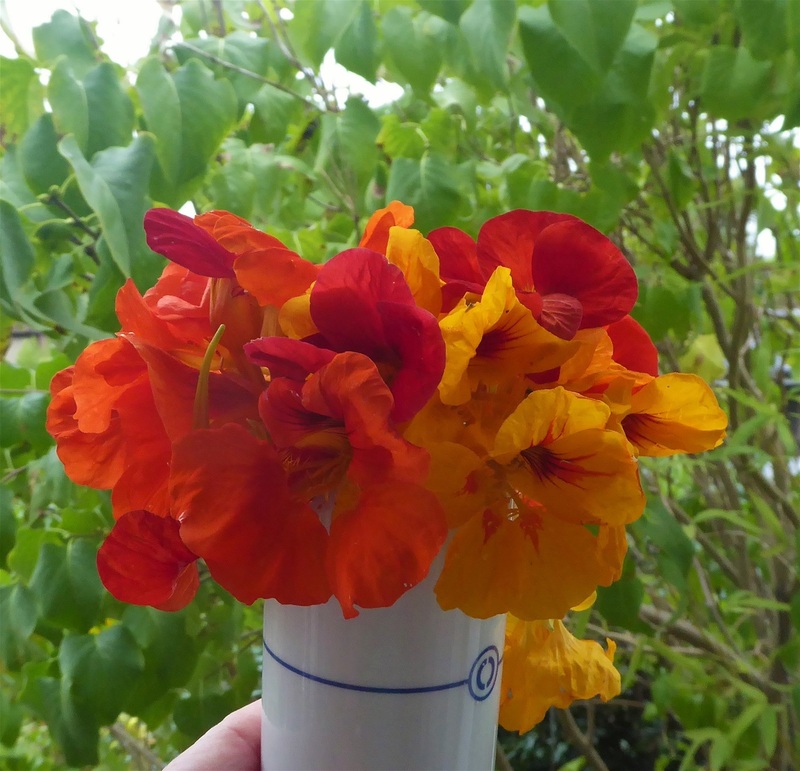 And then there are the flowers, not just a pretty addition to salads, but a great ingredient in Nasturtium Bread. A picture will follow next week as I'll make another loaf when we need one. The pickled seeds give even more flavour, and it is certainly a great celebration of what can be seen as a purely ornamental plant. As soon as the first frost arrives, the plants will collapse into mush, so I am trying to get the best out of them before they have to be consigned to the compost bin. 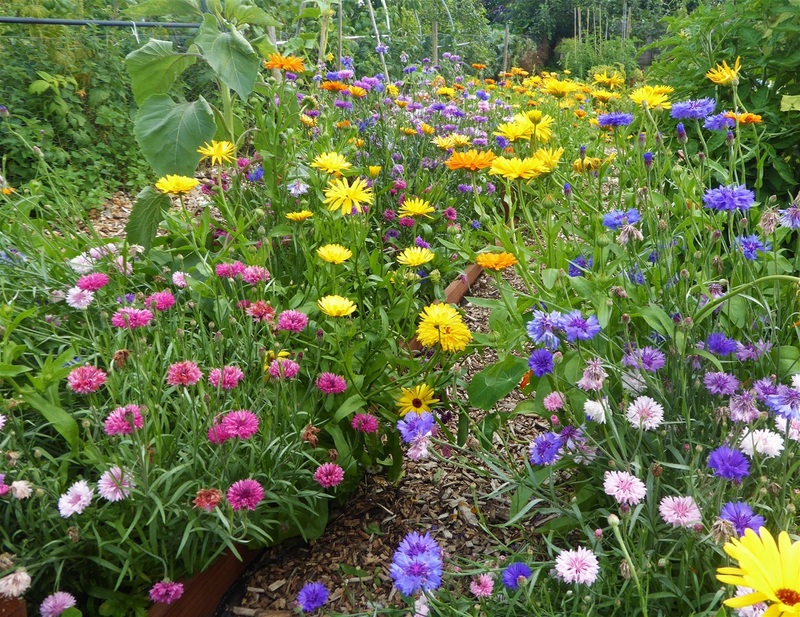 There will be more than enough plants come up again next year from scattered seed: an excellent plant all round! 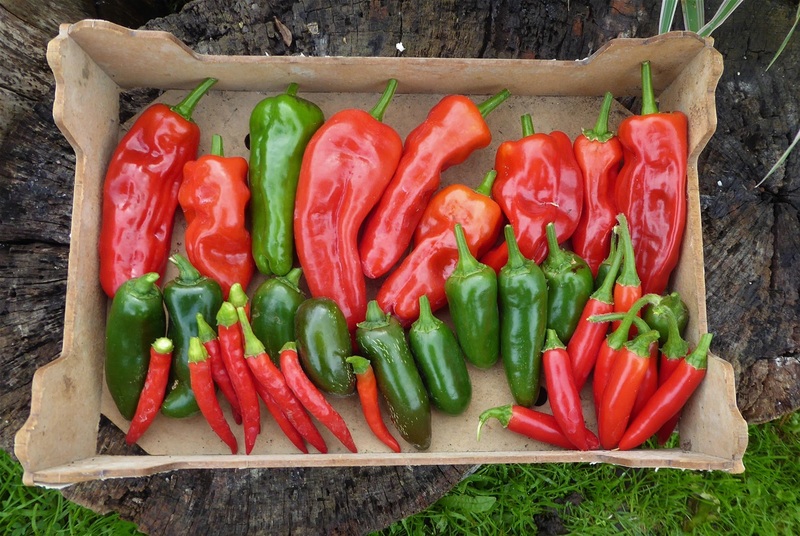 Next we have Chillies and Sweet Peppers, which are ripening in large numbers now. 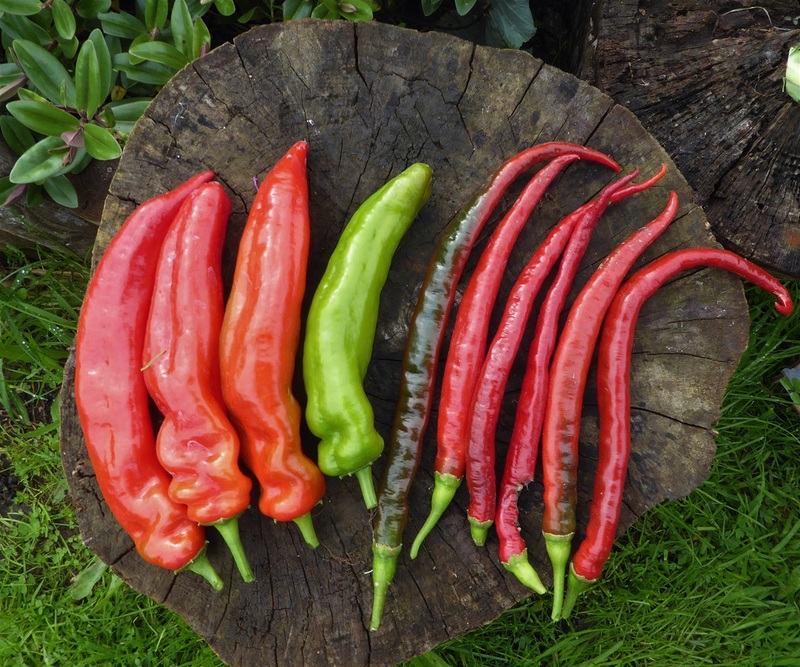 In the top row are Atris, a great pepper with nice thick walls, destined to be preserved in oil, then in the middle row are Jalapenos for jelly, with Yukari Baken and Serrano along the bottom. Then there is a real surprise... an Aubergine! At one point it seemed we were going to have none at all, as despite numerous flowers and attempts at hand pollination, fruit just refused to set. 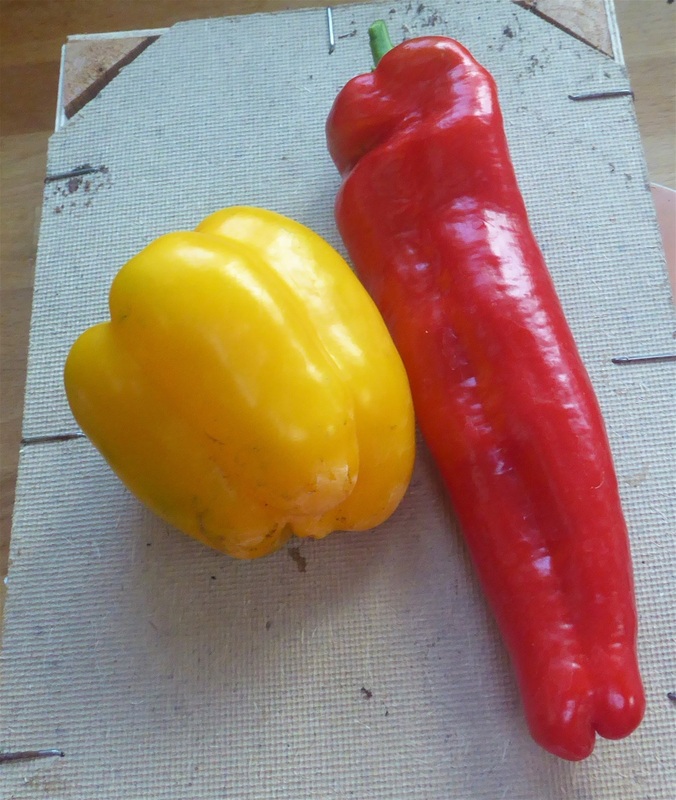 It may have been due to the very high temperatures in the polytunnel, or just contrariness, who knows? 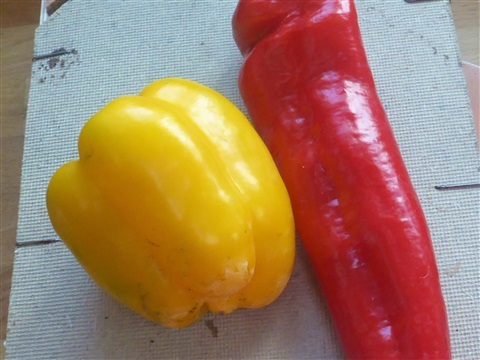 There are two or three smaller ones developing which look as though they should ripen, but this is our sole representative of respectable size. Cucumbers are still coming thick and fast. I have never had plants that stayed fruiting and flowering into October in the greenhouse at home, so this comes as a bit of a surprise, albeit a pleasant one. This week's harvest has been widely shared, but still left enough for this huge jar of Dill PIckles. Just as well we enjoy them, as it will last us quite a while! Cucumbers are pretty versatile, and we have a good selection of preserves now to see us through until next year. 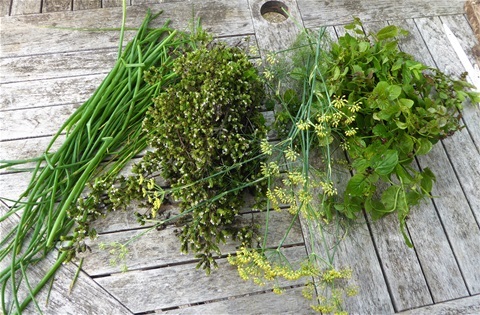 At ths time in the year I try to find ways to preserve some of the herbs we grow for use during the Winter. Curled parsley plants have been cut back and moved into the polytunnel so they can grow nice fresh leaves, some, such as Rosemary, are hardy enough to cope with cold, wet weather, but others die back around now. I cut a large bundle of chives for chive butter, which is now tightly wrapped in the freezer so we can slice off the amount we need for melting into mashed potato, or onto steak. Sage is usually green all year round at our plot, but I am drying a few handsful of leaves just in case, as we do like Sage & Onion stuffing with roast chicken. A few springs of thyme are hanging up in the shed to dry, before the tiny leaves are stored in a jar. Mint dies back too, so I made a batch of Apple & Mint Jelly to preserve enough to use on roast lamb. Oregano is another herb that doesn't grow in the Winter. Last year I dried a large bundle, but it lacked the distinctive smell, so this year I am making a small amount of Oregano oil, to see how that goes. The leaves were wet though, because it had been raining, so I have left them to dry out a bit before adding them to the oil, as I think they may rot otherwise. Poppy seeds and Dill seeds are drying too, before going in their jars, and fennel seeds will be picked later in the week. I found something very unusual inside one of the poppy seed heads: germinating seeds. It has been so wet that the pods became saturated and the seeds started to grow!! And the last harvest is one which I actually picked last week: Sloes. There were blackthorn bushes all along the edge of the field where we were staying, so we picked several pounds, to make sloe gin. 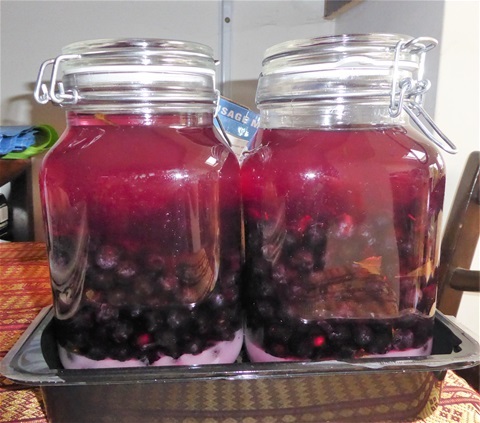 This was one of our mother's favourites, and as children my brother and I would spend a long time poking holes in the sloes with a darning needle to let the jiuce out when they were in the jar of gin. I now just freeze them for a few days before putting them into the gin, then stir the around a bit with a bread knife before adding the sugar. Much easier on the fingers. I'll give the contents a stir every day until the sugar is all dissolved, and then the jars can go into the garage for a few months to mature. While thinking about things in jars to mature, let me tell you about the fermenting cauliflower pickle: lots of bubbles and a slightly pervasive odour of cabbage in the kitchen. The seals on the jars were faulty, so I put the pickle in tupperware boxes instead, which has reduced the smell a bit. 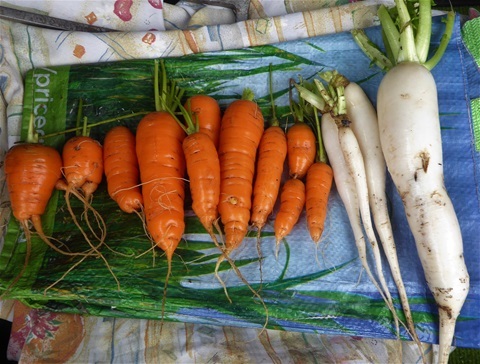 We are away next week so I am putting them down in the greenhouse, which might slow fermentation but will avoid us returning to a house filed with a cabbagy smell. I'd love to know where other people keep such things? And that is the end of our various harvests for this week. Between us we have cleared four beds of weeds, but haven't yet planted the garlic as it keeps raining. Things are looking a bit more purposeful though, which is heartening. 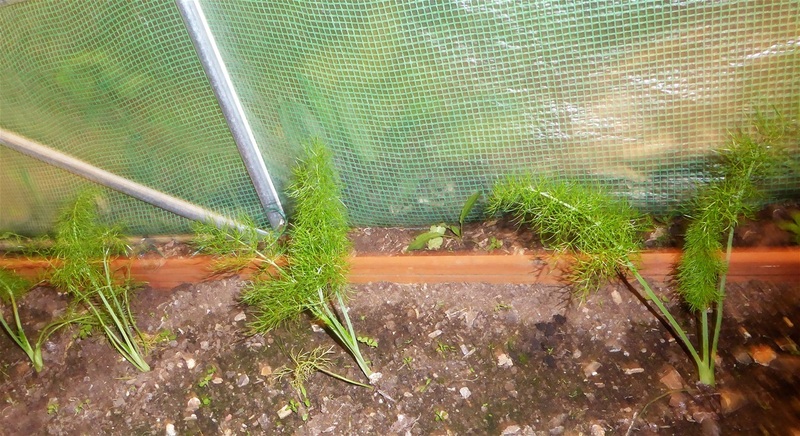 Perpetual Spinach, Florence Fennel and Mustard Spinach have been transplanted into the polytunnel, a little late for the fennel to bulb up perhaps, but we will at least have the green leaves to enjoy. I have collected the dried pods of the Bench Master runner beans and the remains of the climbing french beans, so that the pods can dry fully at home, out of the rain, before taking the seeds out to store for next year. Strangely, the Celebration runner beans have started flowering again, but whether they produce any pods remains to be seen. Working on our plots is so much part of our lives now, that being able to share what we do with so mnay readers is just great. Thank you for reading A Little Bit of Sunshine again this week, and for all the lovely comments too. It is good to know there are real live people out there actually enjoying our pictures and observations. Let's hope we manage to get that garlic in the ground this week!